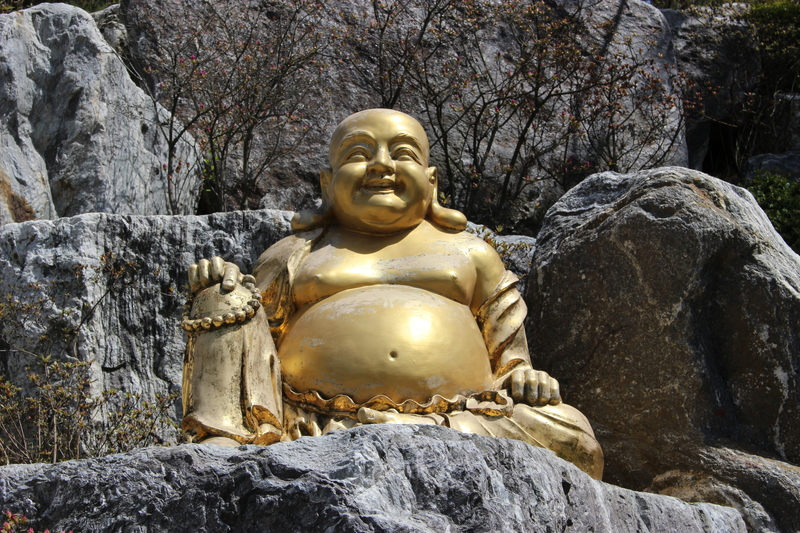 As my travels in Asia have continued to evolve, so have my interests and sights I intend to see when I travel. 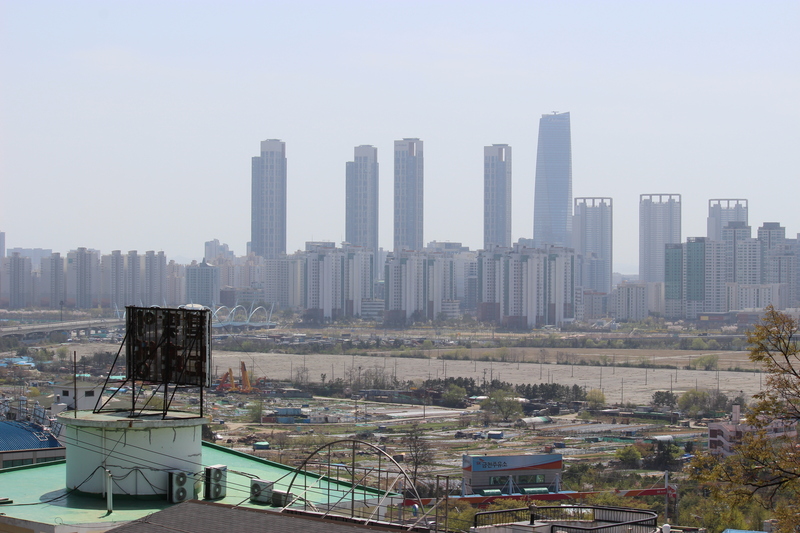 Initially, I looked for skyline photos and other modern aspects that compliment and often overwhelm the Asian mega city. 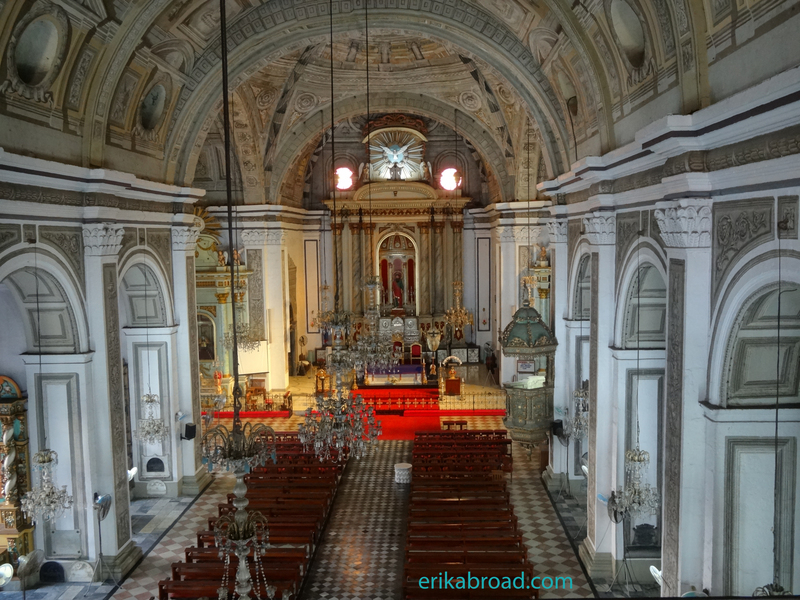 While captivating skyline photos are still near the top of my list when I travel, a new form of building to see in former colonial cities now tops my list of places to see: Catholic Churches. 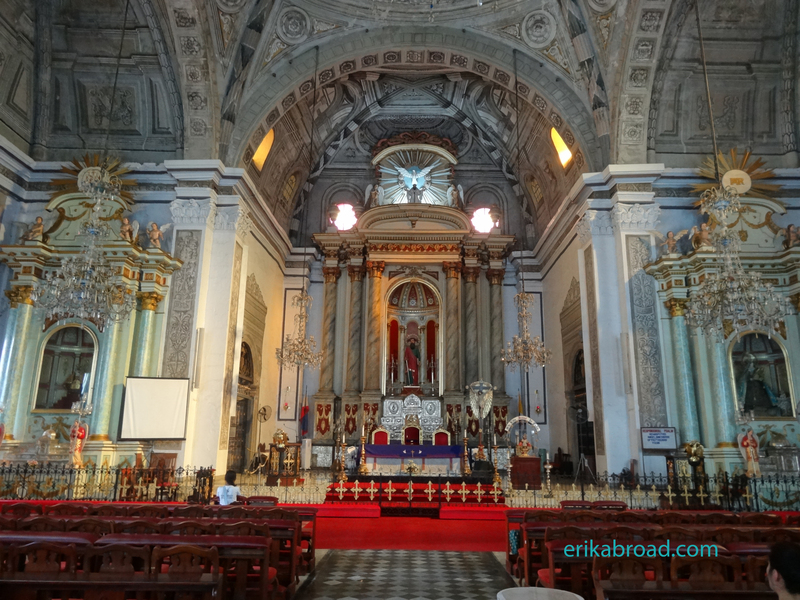 This may surprise some readers 3when you find that I am not Catholic, but the intrinsic beauty and Architectural components within many of the colonial-era Catholic churches in cities like Manila and Macau are ripe with these buildings and all the history attached to them. 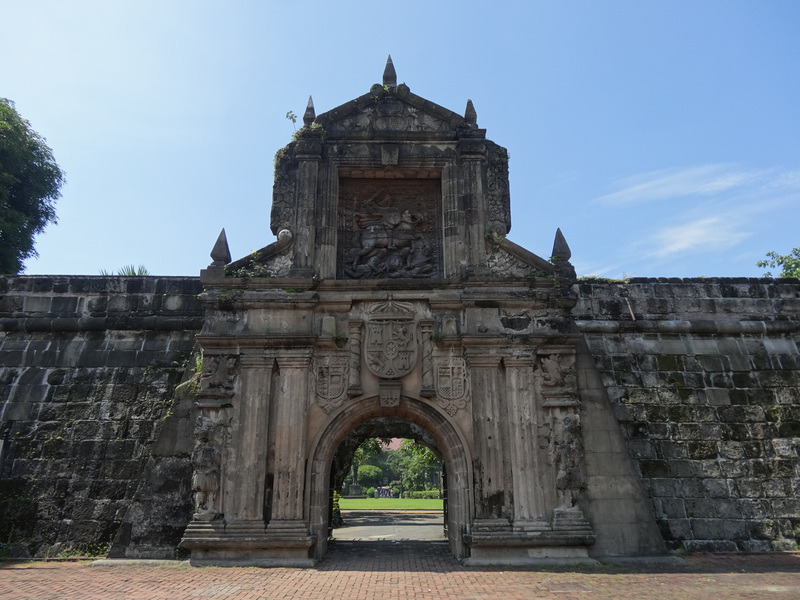 Many buildings in Manila’s Intramuros had fantastic, vibrant colonial-era exteriors and architecture, but San Agustin Church (founded in 1607) was a cut above the rest. Its unique form of beauty, both on the interior and exterior stole the show for me. 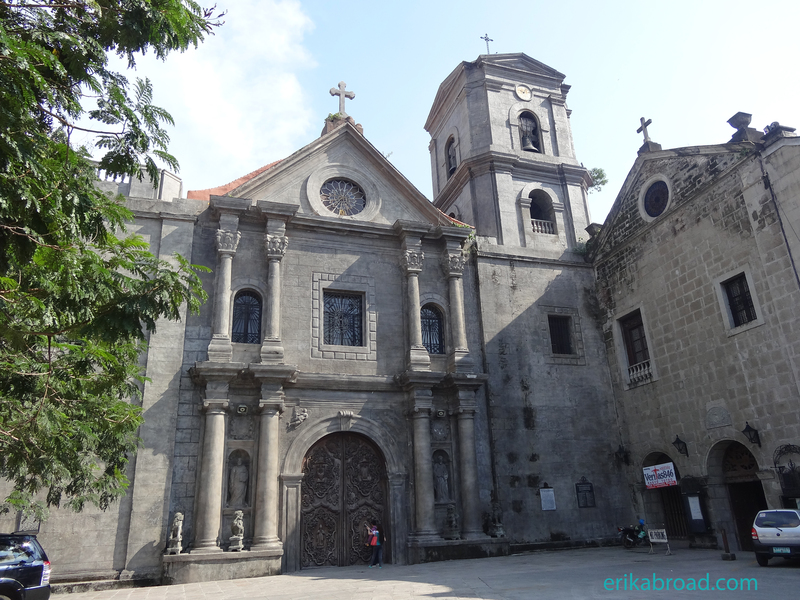 When I did research about Manila before my trip last weekend, I was immediately mesmerized by the brightly colored, almost florescent stucco exterior of the San Agustin Church. 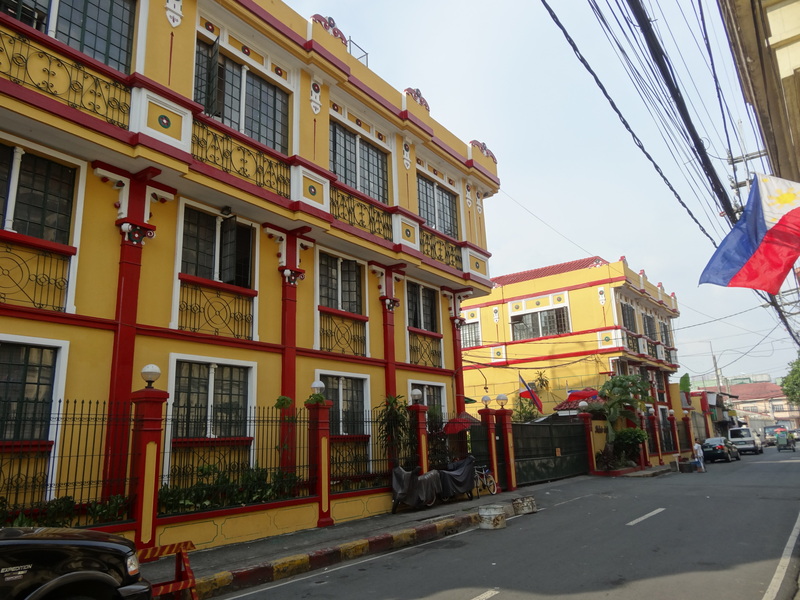 Images online all showed the Philippines’s oldest adobe building adorned with pink, peach, red, or yellow walls and white window frames and pillars. 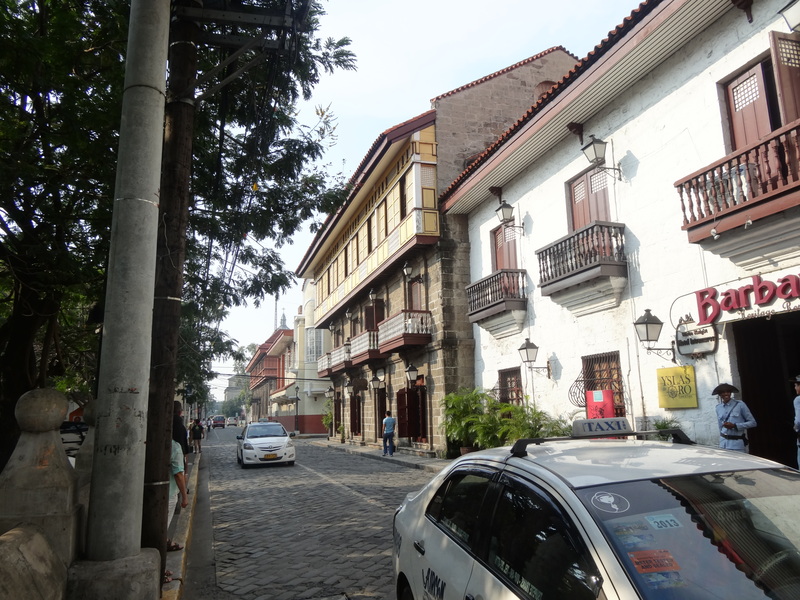 The feeling was distinctly Spanish and colonial, so I could not wait to see it. When I first arrived, I was in for quite a surprise: the colors were GONE and the bare, four hundred year old walls, were fully exposed to the outside world. While some may have been disappointed (I certainly was), reflection has allowed me to realize the true beauty and character of this church. 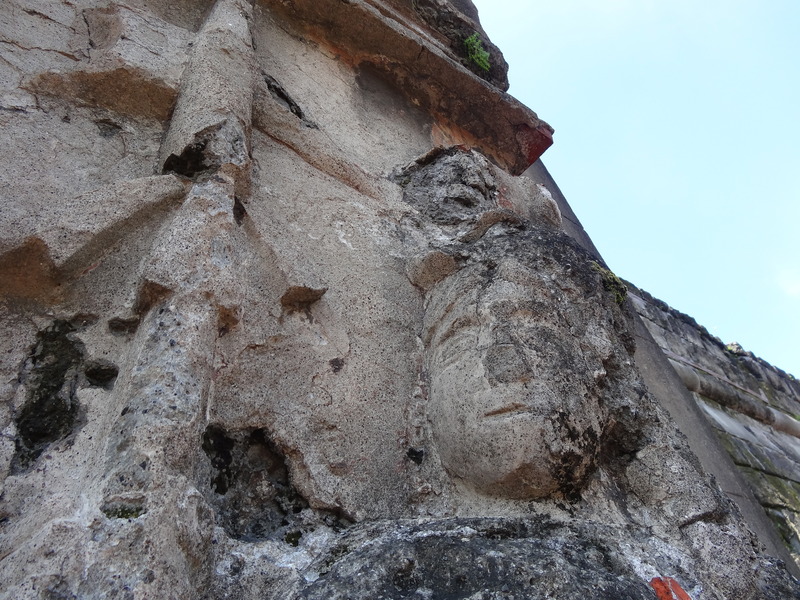 While it was disappointing, the exposed exterior shows the amount of craftsmanship and skill that went into constructing a stone church the size of San Agustin. Everything from the mortar to the pillars and regular facade had a lot of wear, the type of erosion which only buildings with immense character hold. After passing through the double doors on the right side and entering the church, I entered the interior courtyard of the church, which, although as bare as the exterior, exuded a similar sense of beauty in its plainness. 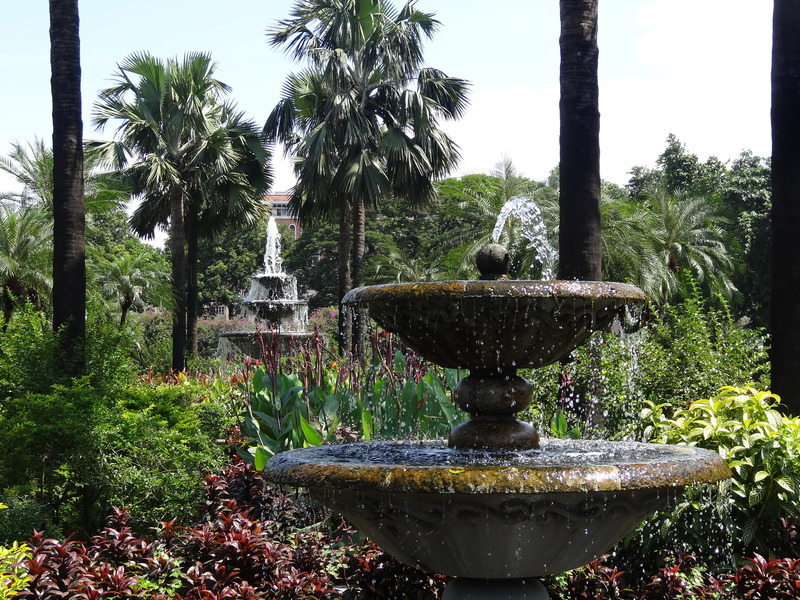 The palm trees and fountains provided another unique scene. 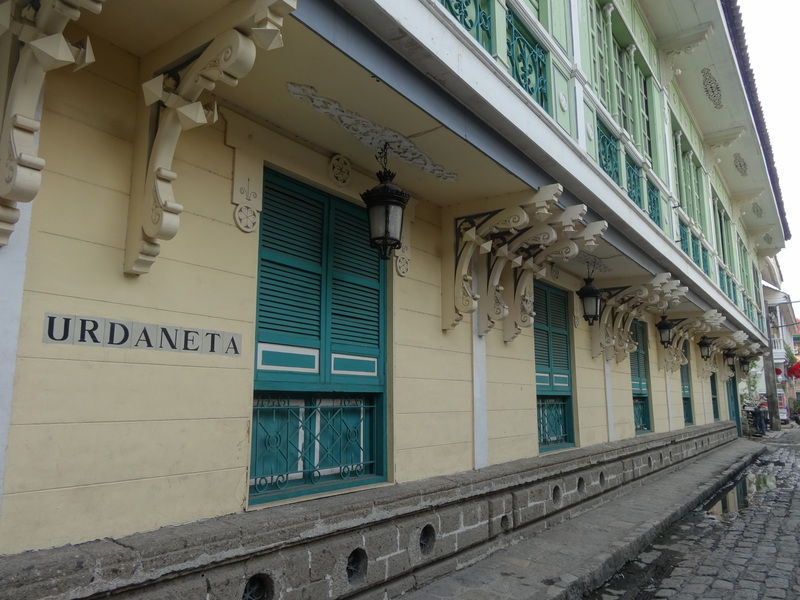 After entering another set of doors in the back side of this plaza, More stone corridors were waiting for me, and somehow the cool temperature of the hallway and the accompanying oil paintings of Catholic leaders in Manila through the centuries showed a different sense of plain beauty. 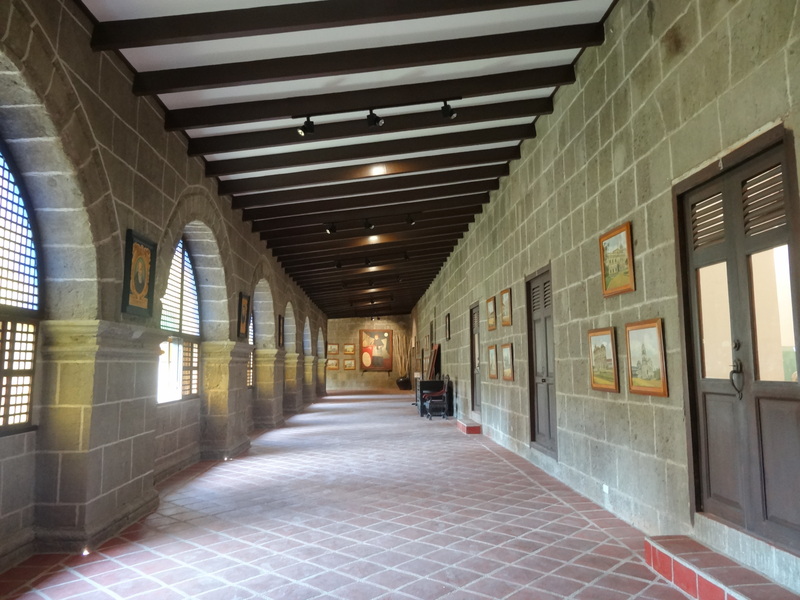 All of the hallways in San Agustin resembled this one in one way or another, with ceiling heights varying slightly between floors. It was the first time I have seen hallways like this in a Catholic Church since I set foot in the Church of the Holy Sepulcher in Jerusalem back in 2013. At the end of this hallway, another first inside of a Catholic church awaited: a completely bare, bricked dome. 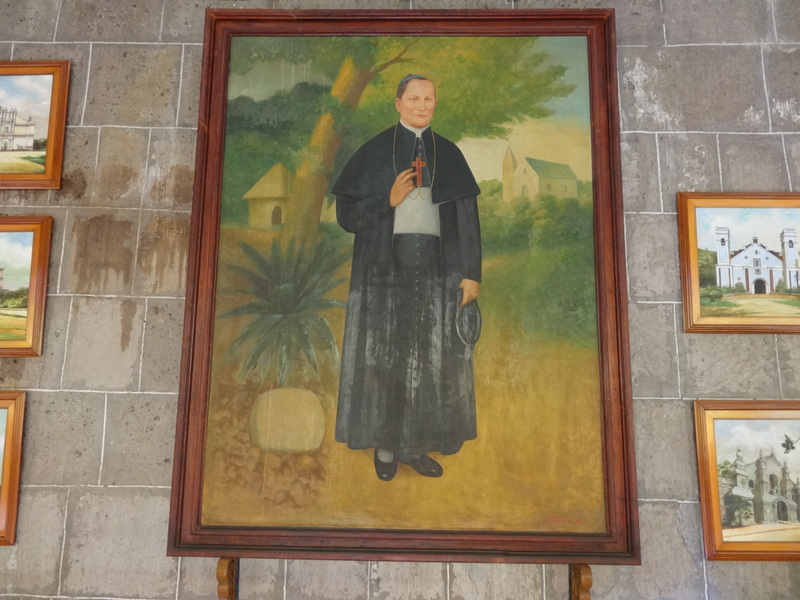 As I have visited more and more churches, I have become accustomed to ornate mosaics or paintings at the top of many domes inside of these churches, but San Agustin was so different. There was no artwork at the top of this dome. The cool, dark hallway, only illuminated with a chandelier and sunlight provided yet another, different, backdrop for another amazing piece of architecture in Manila. 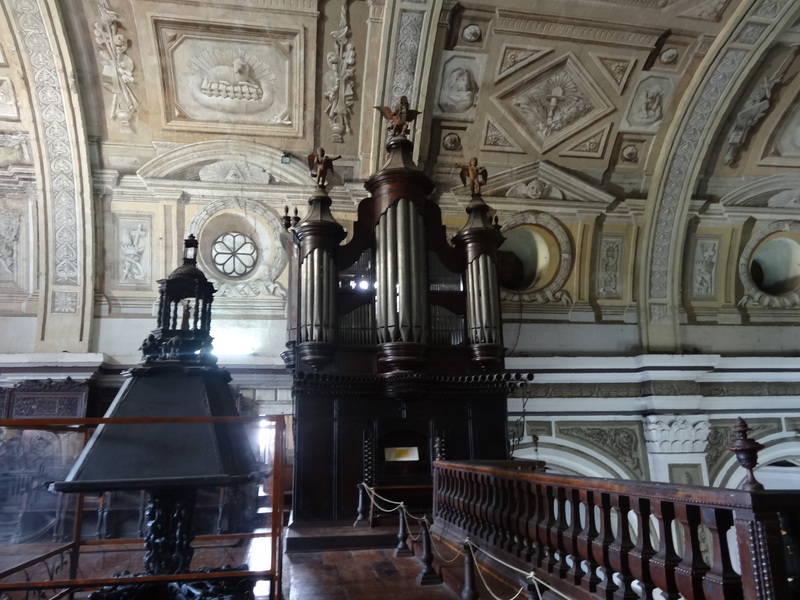 After entering the second floor of the building, I encountered the church organ, and then to my right, a spectacular view of the altar and pews of San Agustin. As you can tell from the ceiling’s stonework and the woodwork style, San Agustin boasts a baroque style of architecture certainly unique to this part of the world. One of my family friends is an organist, and I could think of him playing this centuries-old organ as the pews fill on hot and steamy Sunday morning in September. The view over the railing was spectacular. High ceilings, dimmed and off chandeliers, simple painting on the ceilings, and an acoustically pleasing main hall accent an ornate and spectacular front altar. In the aforementioned paragraphs, the simple, historic, and cultural implications of San Agustin make this one of the most beautiful Catholic churches I have ever seen. Next up on the tour was the main floor. The altar was as spectacular as the rest of the church. High ceilings, marble pillars, and Spanish paintings dominated the main hall. 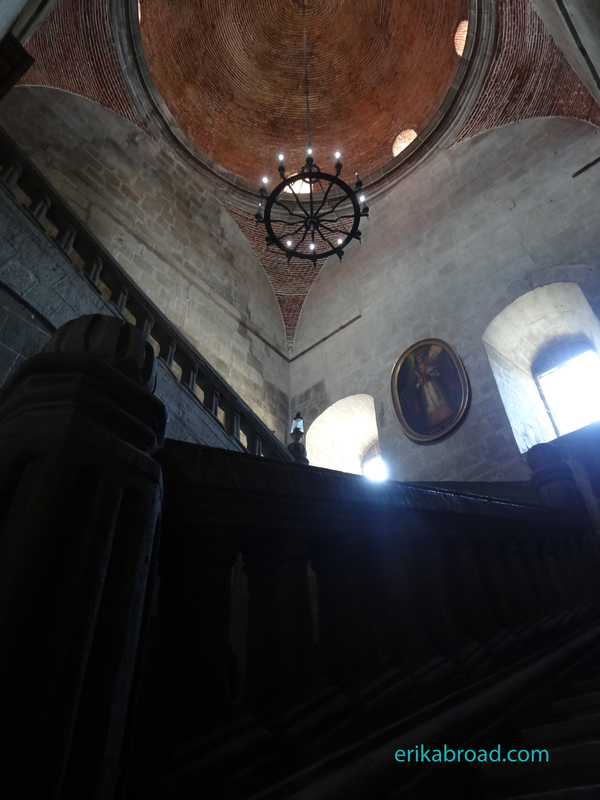 The ornate masonry and stone carvings on the ceiling were the highlights of the architectural components of the main floor in San Agustin. Even though I was initially met with disappointment surrounding the exterior of San Agustin, I am so happy that I continued to explore the interior of the oldest stone church in the Philippines and certainly one of the oldest churches in Asia. 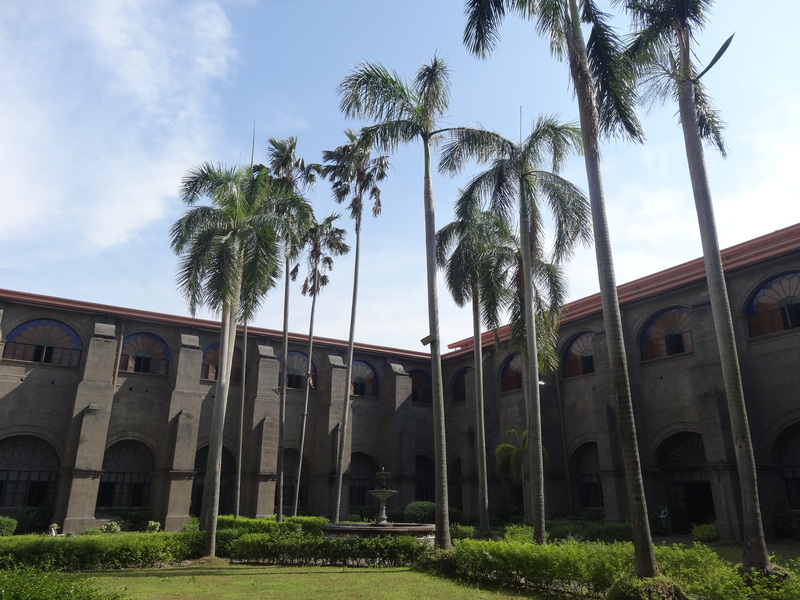 The high ceilings, palm trees, plazas, and bare, stone walls created a very different, memorable, building for me. 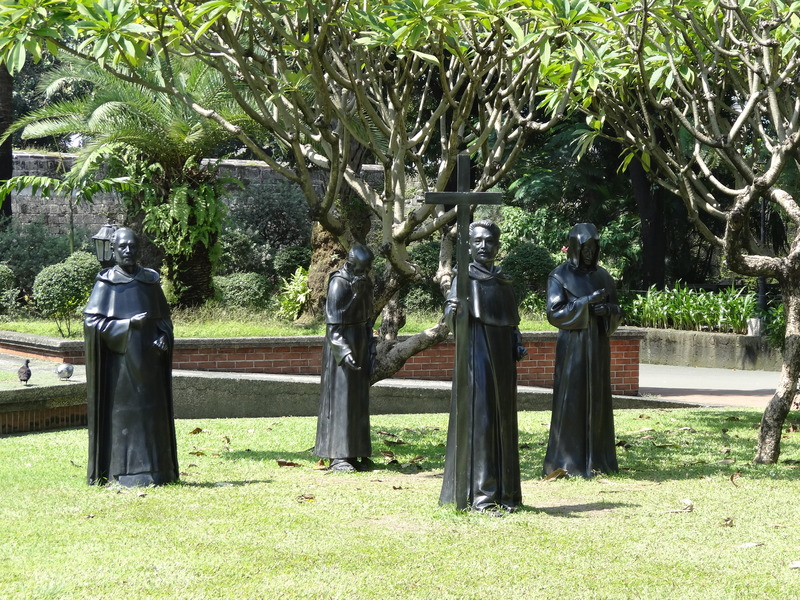 Much different than other churches in Asia and North America, San Agustin stands alone for several reasons. 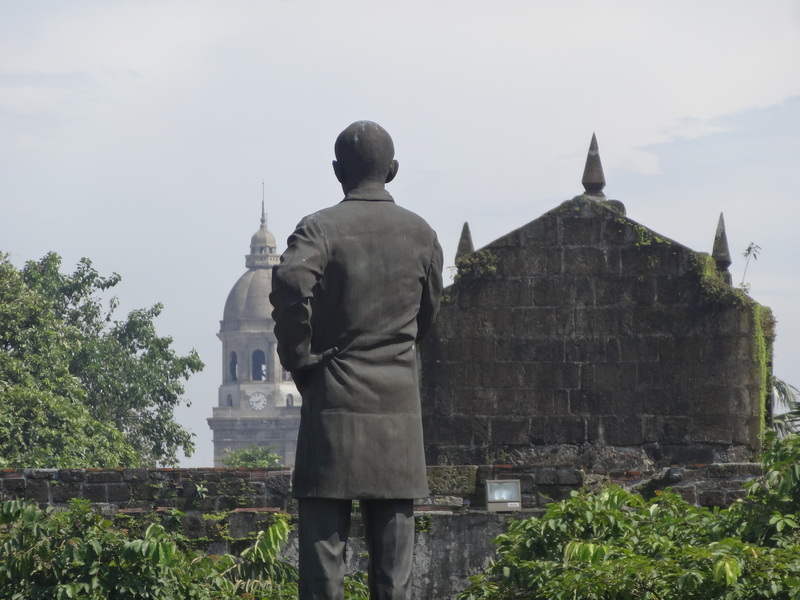 When you stop in Intramuros, I hope you take a few minutes to tour this fantastic church. Following a jam-packed first day in Taipei and a long night’s sleep, I was ready to go for another grueling day eating the best street food and seeing the best sites Taiwan had to offer. It’s a good thing, too, because this day was even more grueling than the first day. First up on the schedule was a rendezvous with one of my friends from college, both in Japan and the United States. David and I were off to Taipei Station. Stepping into the main atrium at the station, I felt like I was back in Japan, with high ceilings and shops in every corner at the station. 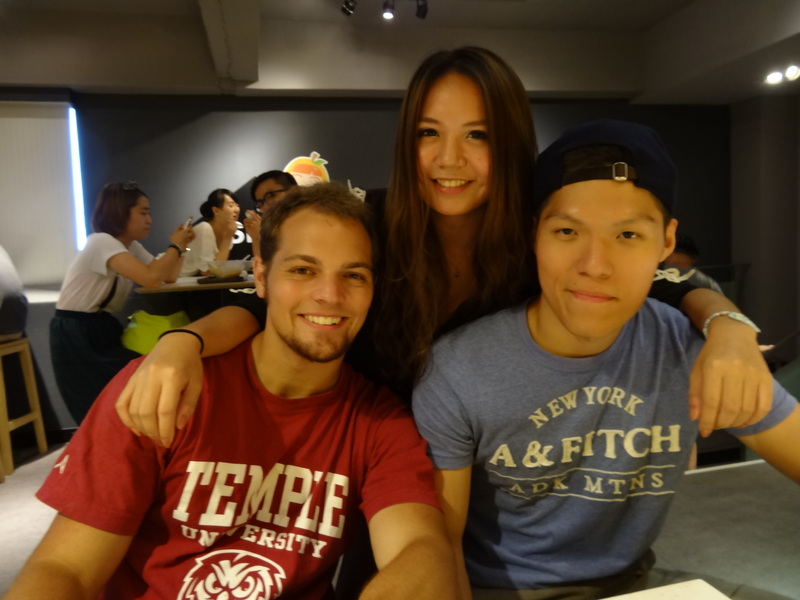 Once we arrived, we found Karina in a Taiwan-style restaurant and recounted and rehashed our stores from college and talked about what we have been doing since we last saw ourselves in Philadelphia nearly two years ago. I often echo this sentiment on many of my posts on here, but I am always grateful when I meet my friends from college at different locales in Asia. Many people lose touch with their friends from college, but I am very fortunate to have been able to keep in touch with so many people given how busy all of us are. After downing some delicious fried pork, some noodles, and some other Taiwanese delicacies, we were off to our first stop of the day, Freedom Plaza. 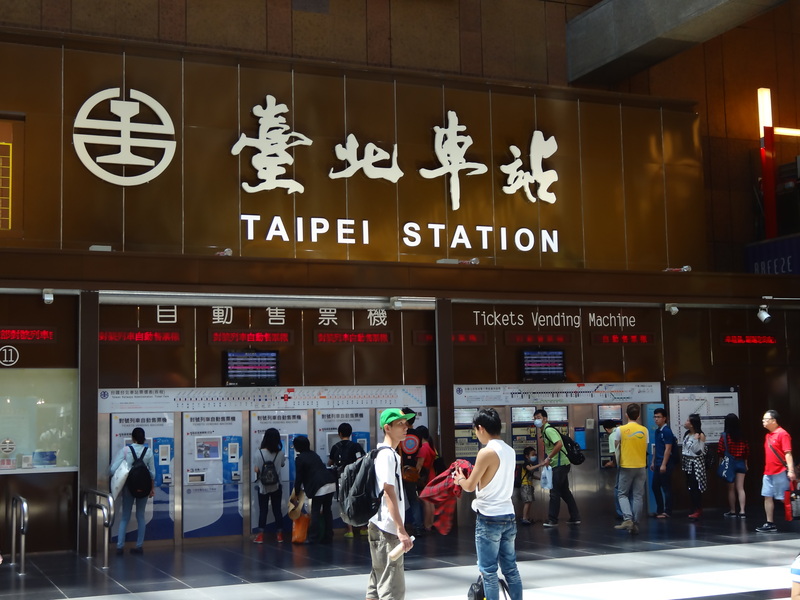 After a short trip on Taipei’s subway system, dubbed the MRT, we were greeted by the sweltering humidity that had built as the day progressed. A quick stroll and turn to the right led us through the gates in this photo and into Freedom Plaza. 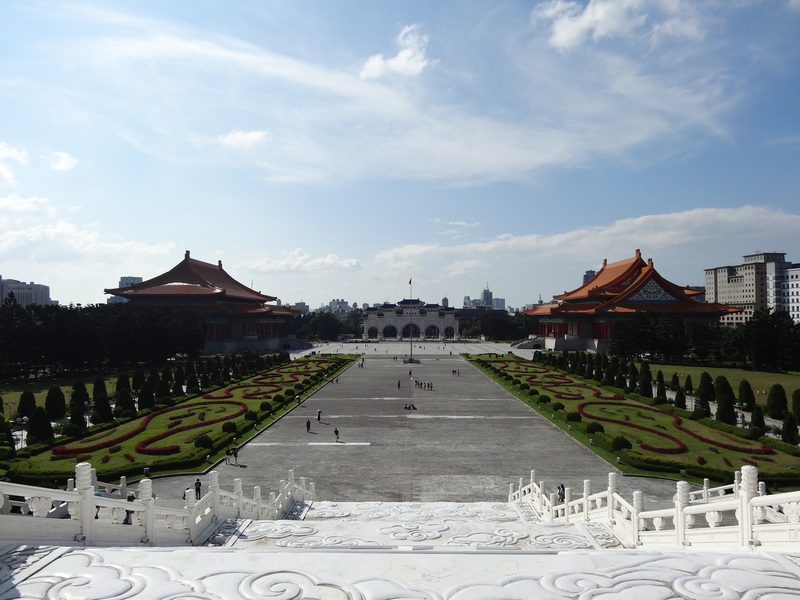 I was very impressed with the size of the plaza in the middle of a bustling metropolis like Taipei. 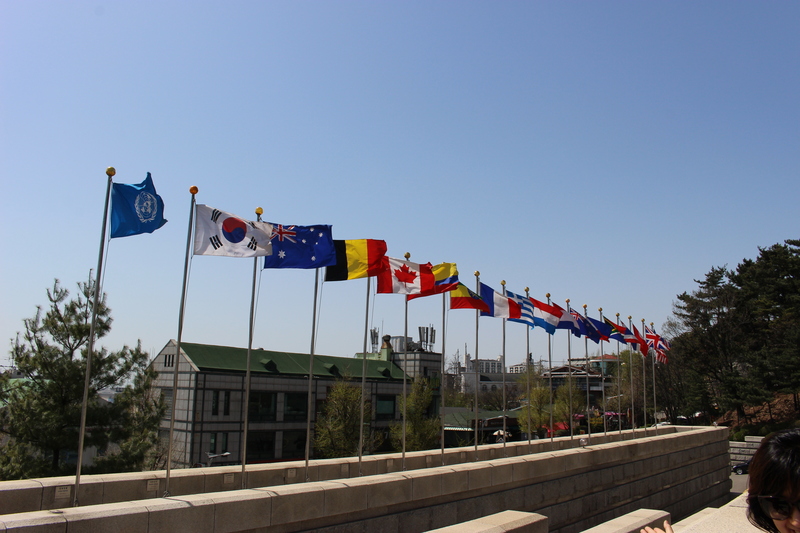 Traditional buildings flanked the plaza, with its focus on the Taiwanese national flag situated in the middle of the plaza. 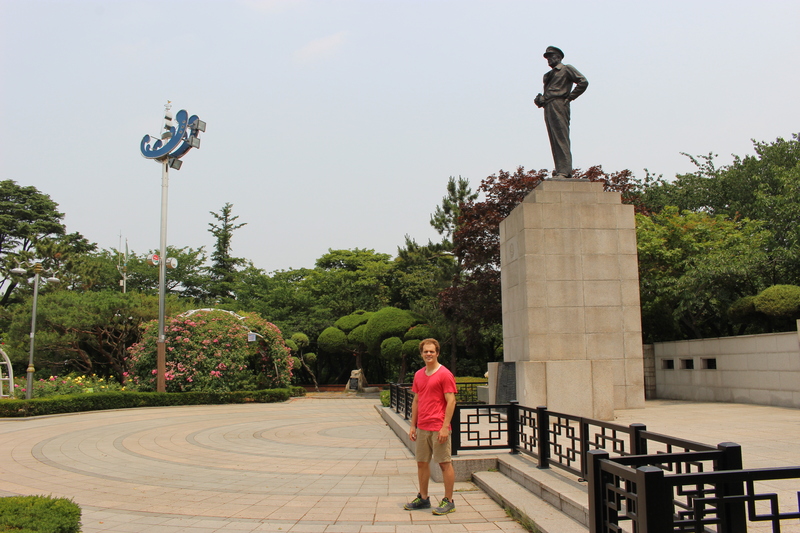 We were on our way to see the Chiang Kai-shek Memorial Hall at the other end of the plaza. As soon as I saw it, images of the Lincoln Memorial in Washington, D.C., filled my mind. 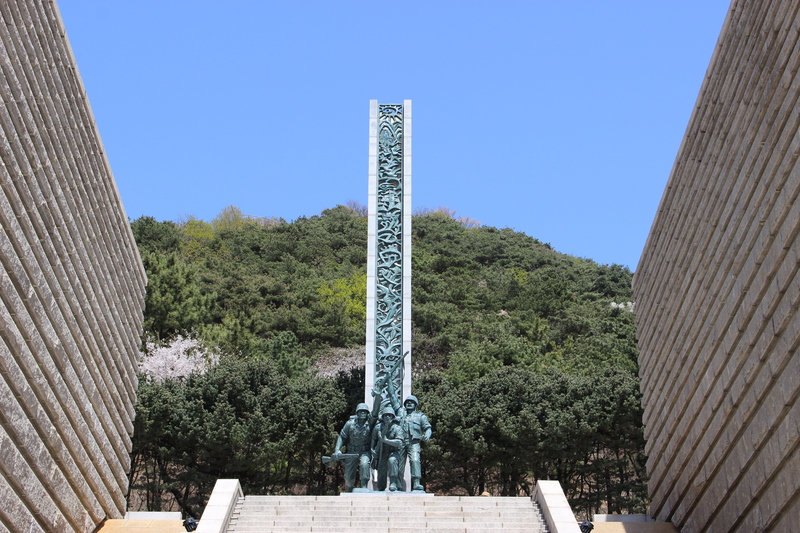 The similarities between the two memorials are striking: a hike up several levels of white stairs led into a large, high-ceilinged rom with one main focus: a gargantuan statue of a national leader. 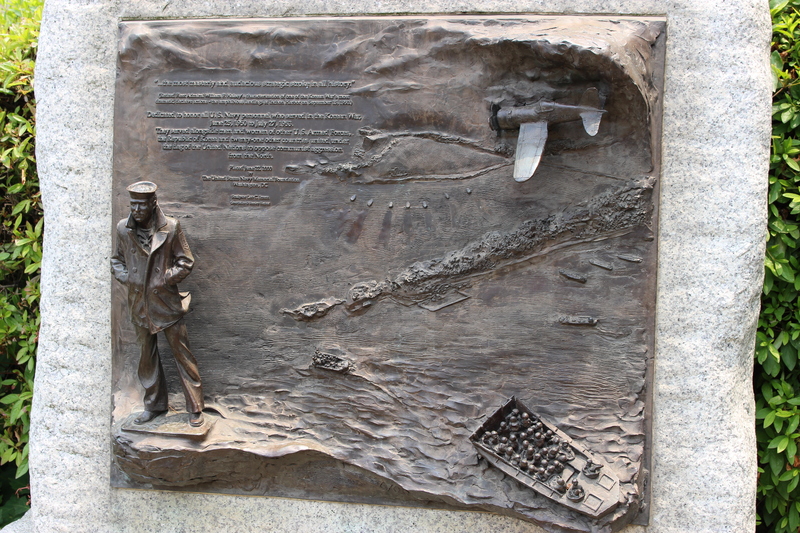 Once you first see the statue, it would be almost impossible not to think about the Lincoln Memorial. While the materials are different, the exuding feeling is similar. 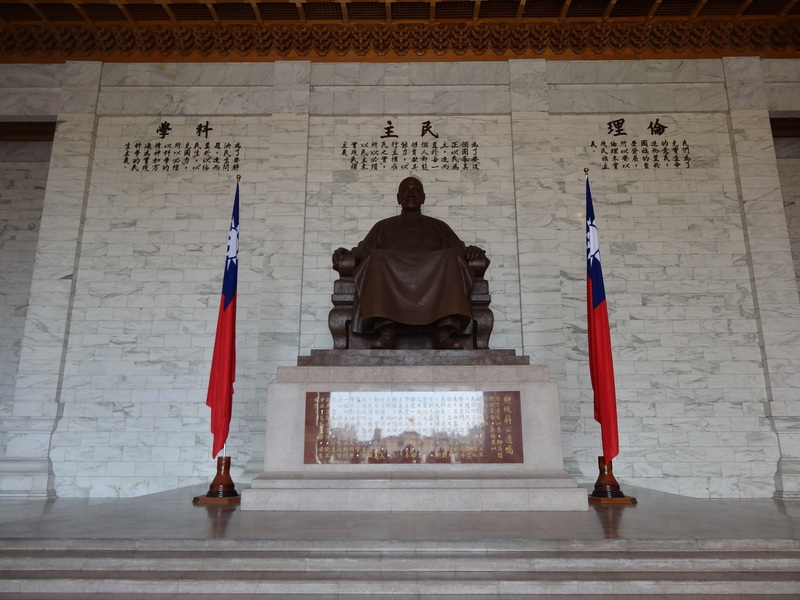 The statue of Chiang Kaishek dominates the massive room. Following some perusing in the museum area of the memorial, we returned to the statue area to watch the changing of the guard ceremony. That, too, was exciting and very interesting to watch. Once the ceremony was over, we returned to the MRT to go to a different part of the city with another food in mind: mango-flavored ice cream. Following a short ride on the MRT, we arrived at the ice cream parlor and sat down to have more conversation and discuss my thoughts on Taipei before Karina had to go to work for the rest of the afternoon. Although we had planned to speak about Taipei, I noticed something interesting about the people who sat down next to us: they were speaking Japanese! Quickly I was in the midst of a conversation with these three Japanese tourists about life in Japan. This was a very interesting conversation and my friends did their best to communicate with them even though they did not understand our Japanese conversation. Little encounters and conversations like this make learning and speaking another language very enjoyable for me. 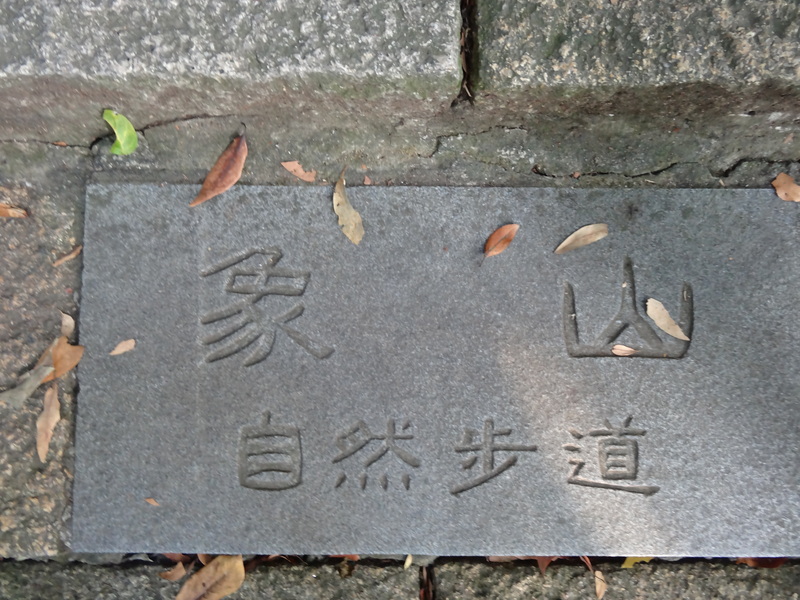 No matter where I go, I usually run into Japanese tourists at famous landmarks in Asia. 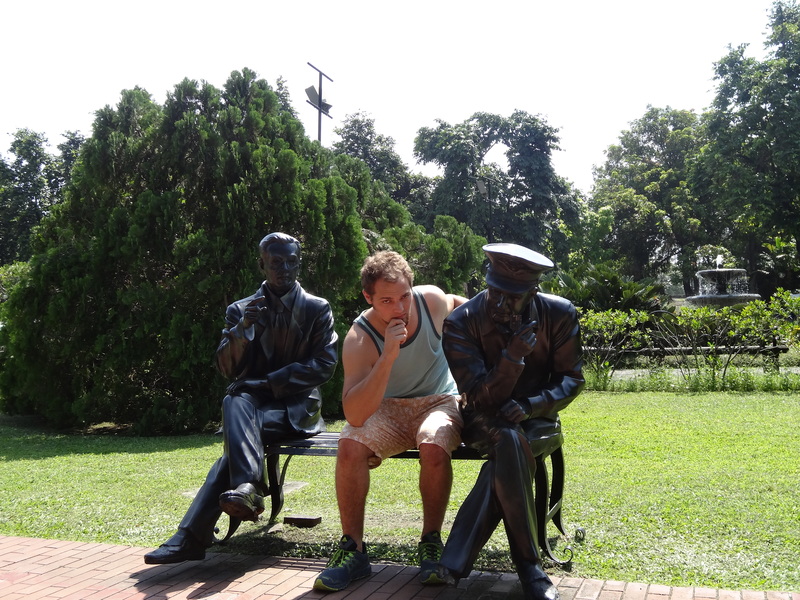 The Japanese tourists were on their way and we lingered for a while longer to reminisce. It was a great morning with Karina. 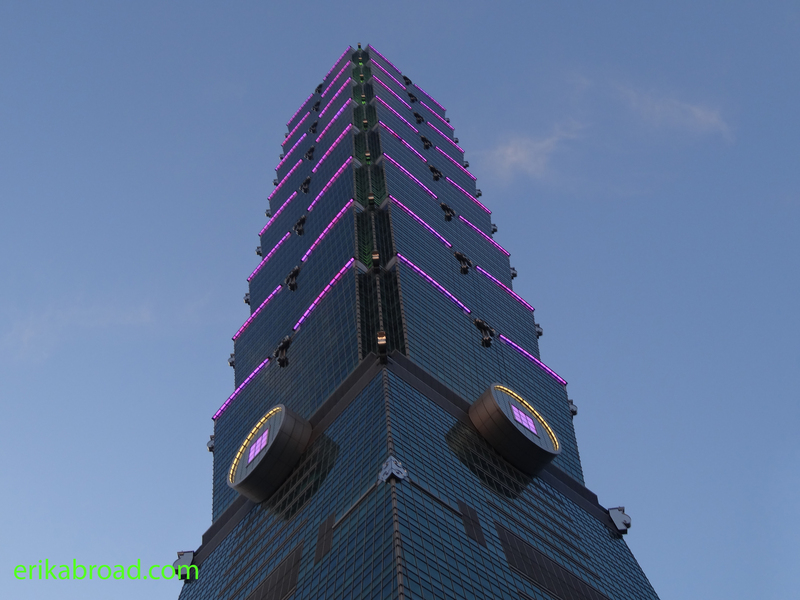 The three of us took a bus to Taipei 101and split ways, with Karina going to work and David and I continuing on to hike up Elephant Mountain, the most famous viewing point for Taipei 101. We saw the night view yesterday, so naturally we were headed up in the afternoon for a daytime view of the world’s second-tallest building. 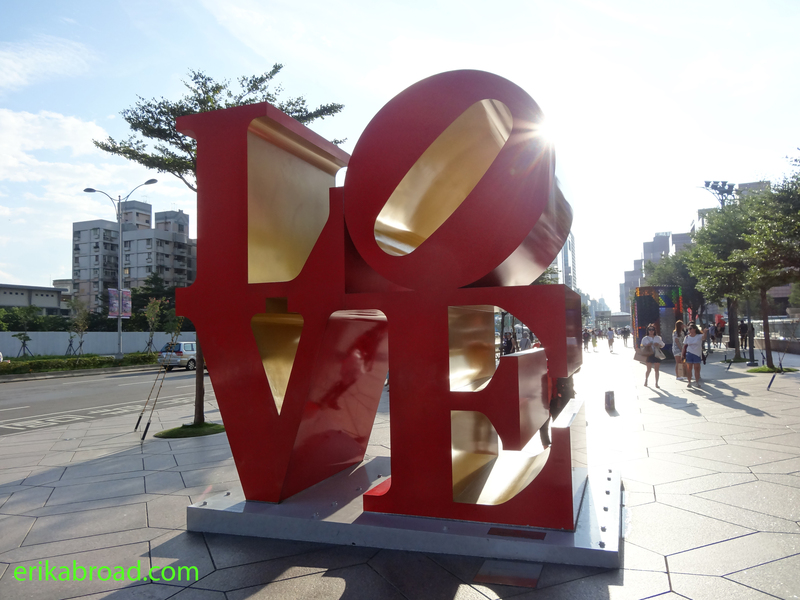 On the way to the mountain, I noticed Taipei copied another famous Philadelphia landmark, the LOVE statue. The humidity continued to increase and by the time we made it to the base of Elephant Mountain, my shirt was completely soiled with sweat and so was David’s. The sweat was dripping off the faces of everyone descending Elephant Mountain following the climb, so it was obvious that we would suffer the same fate following the twenty minute hike to the outlook point at the top. Scenery at the start reminded me of Macau, which was also unexpected. 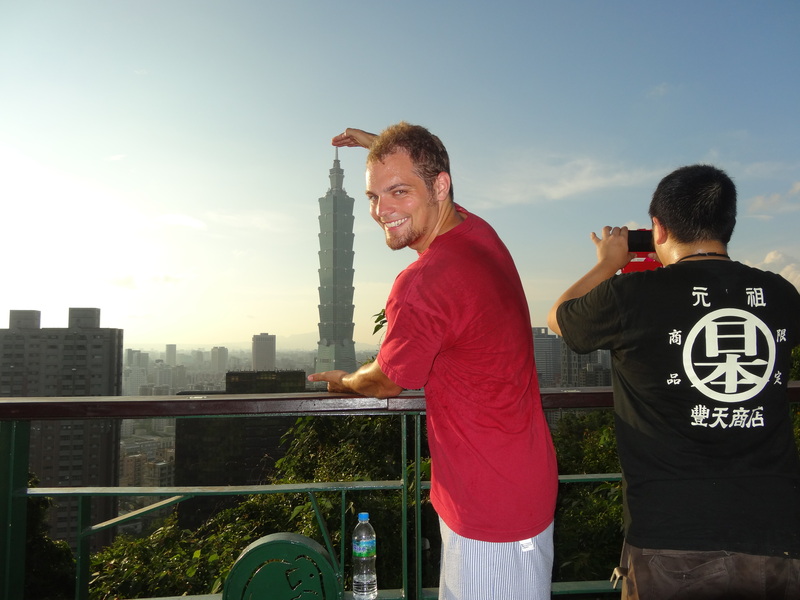 As the hike up the narrow stairs began, I could not wait to see the spectacular views of Taipei 101! David and I passed some children and elderly visitors making the hike and finally made it to the first landing, and, oh, was it a sight to behold! Taipei 101 cut through the sky and was spectacular. I posed for a photo with the world’s second-tallest building even though I was soaked with sweat. Ten minutes later, David and I made it to the top and climbed up some large boulders to take in the skyline and snap some photos. the cameramen already atop these boulders made for an interesting foreground. 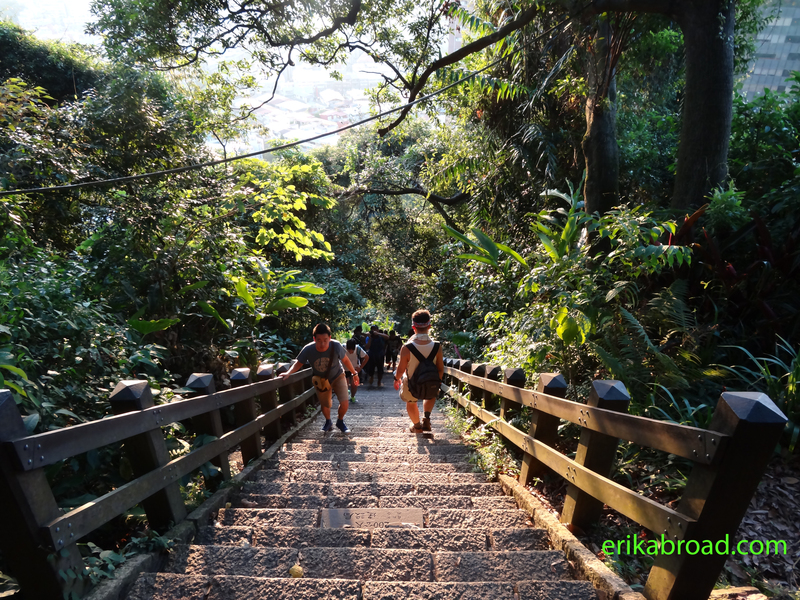 As the sun began to set, David and I moved in unison with it, descending Elephant Mountain’s steep stairs. Then, in the middle of our descent, I encountered one of the most beautiful views of a skyline I have ever seen: the setting sun illuminated the humidity and smog which engulfed Taipei on that Sunday afternoon. The resulting view was fantastic. I will never forget this scene as long as I live. David and I stopped at the base of Taipei 101 for some photos and then were off to see more of the city before it was too late in the night. This evening’s purple lights were fantastic. First up on the night’s agenda was another night view of Taipei from a different location. 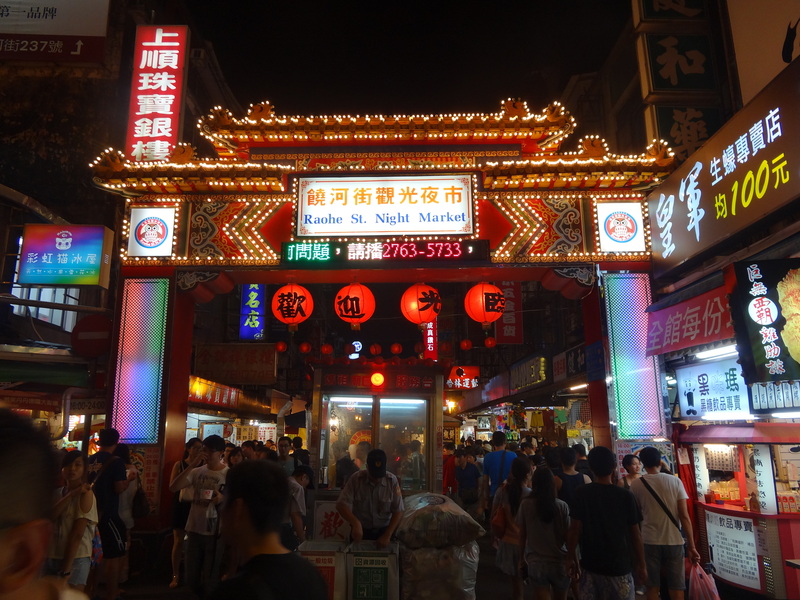 Following a long motorcycle ride, we found out that location was closed due to road construction, so we quickly changed plans and decided to go to Taipei’s second most famous night market and included a stop at one of the city’s most famous temples, too. Much like the previous night, David and I indulged on many foods and drinks as we walked through the narrow stalls and dogged the rain drops that intermittently spritzed throughout the night. Milkshakes, hot meat sandwiches, finger food, and pork ribs were all on the menu tonight. I am always impressed with the intricate nature of the woodwork that always adorns the temples in Asia. 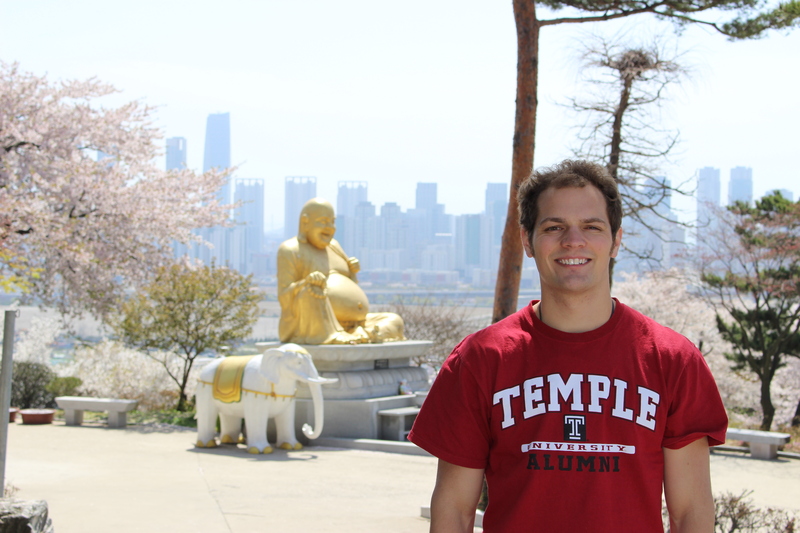 After a few hours enjoying the food (and wi-fi) in the market, my time with David in Taipei was essentially over. It was amazing to get a tour of one of Asia’s most bustling cities from a local perspective while also rekindling a lost friendship. 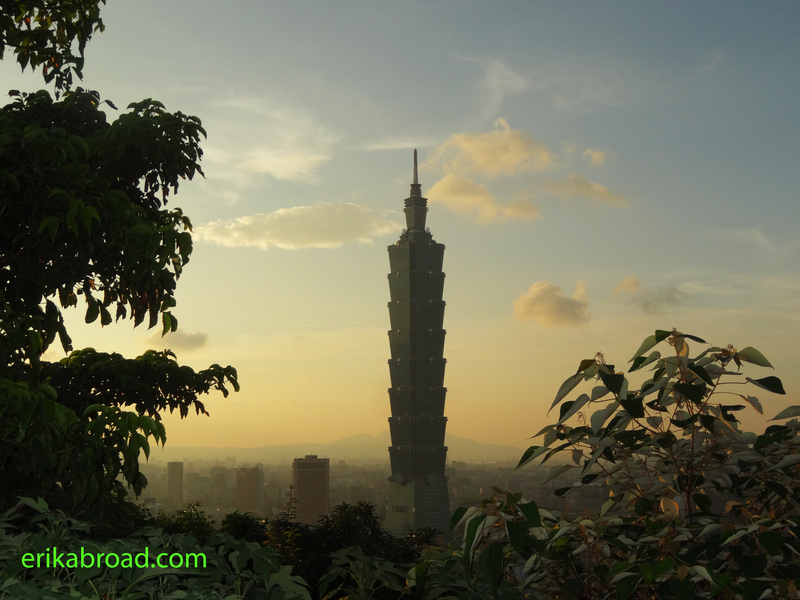 Seeing Taipei from atop a motorcycle, in its back alleys, and from its most famous lookout points helped me appreciate one of Asia’s most underrated destinations. While I fully admit my feelings for Taipei over the first two days are largely dependent on the willingness and eagerness of my friends to be fantastic hosts, I recommend Taipei to anyone whom is seeking adventure and i unique mix of Eastern and Western history. Aside from a random traffic stop at 2:30 AM following a very late dinner, this trip was stress-free and amazing. 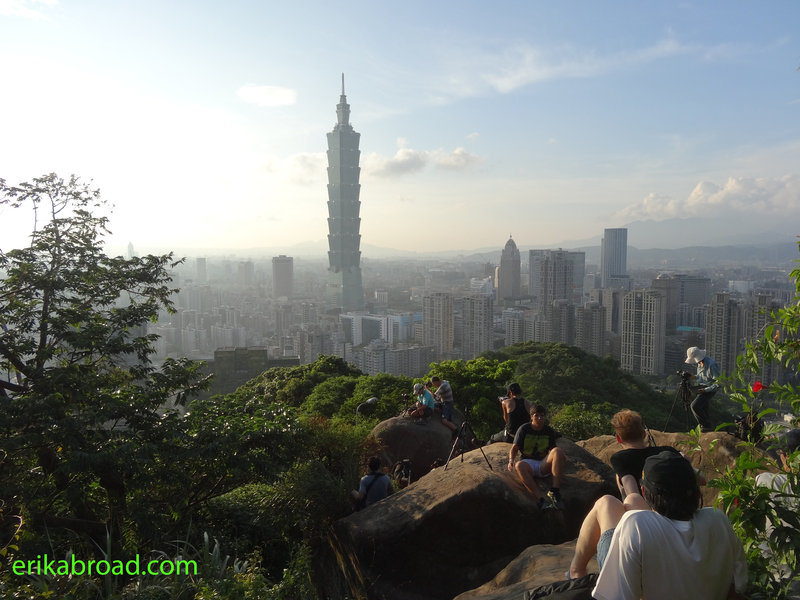 To this point, Taipei is certainly my favorite destination in Asia, alongside Macau and Seoul. Only one more day remained in my Taiwanese adventure and the next post here will certainly provide insight into my third and final day in Taiwan. Last month, I embarked on a journey I was towards the top of my my list for travel destinations in one of Japan’s more unlikely places: Okinawa, specifically Naha and the surrounding areas. 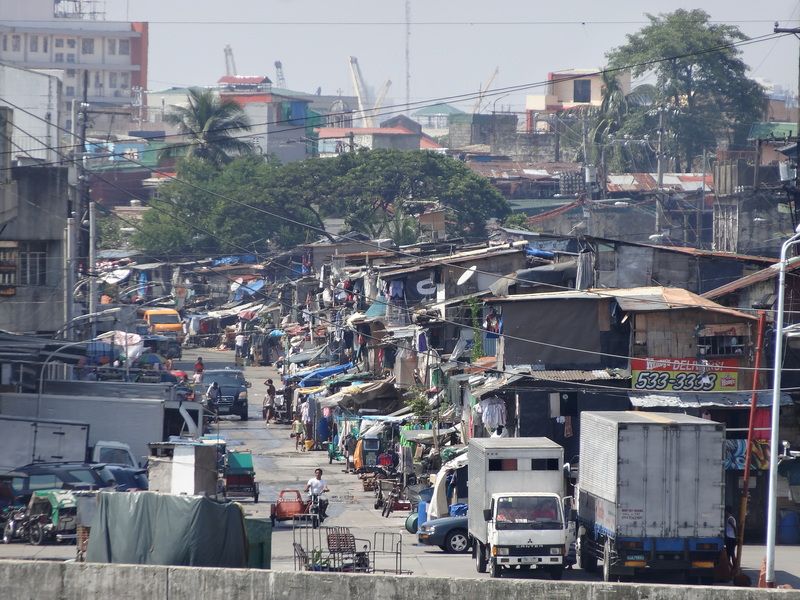 When I travel, it is usually purely for leisure, sampling local foods, and taking photos at the famous locations and historical sites I encounter while walking through the streets or dashing from point A to point B. 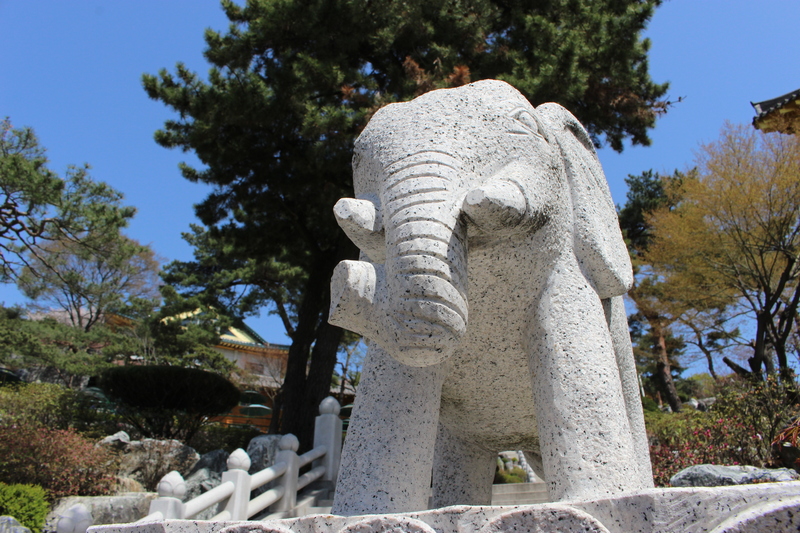 This time, the travel was very different and had a much deeper, personal meaning. 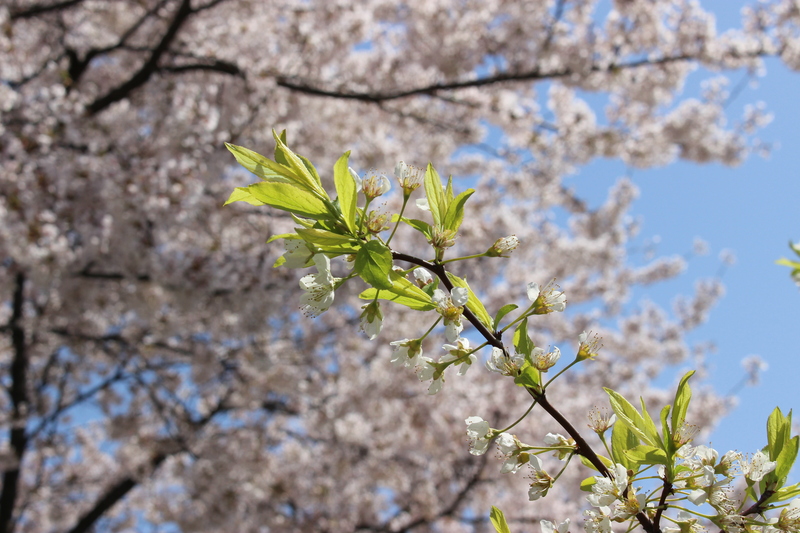 Let me preface the discussion with now of the questions both foreigners and Japanese ask me all the time in Japan: “Why did you come to Japan?” My answer, as I have discussed before on this website, is different than many other traditional answers. I have never had any interest in manga, anime, or video game culture. I actually never really even had an interest in Japanese food before I went to Tokyo for the first time some three years ago. 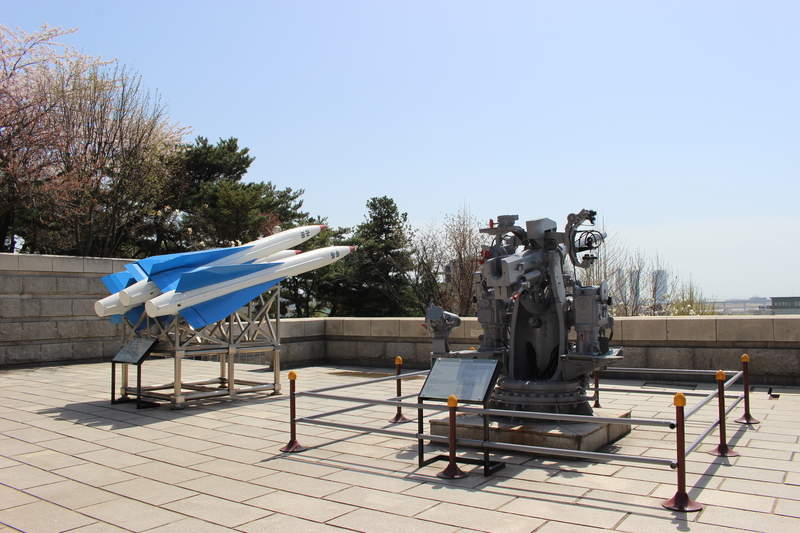 My reasons always surrounded the important role the Japanese plays in US military and security policy in the Pacific and the large role the Japanese play when it comes to international trade and economic might. There is, however, one more, more personal reason that I have not discussed on this website: my grandfather. My grandfather (currently in his upper-80s and very healthy) joined the United States Marines following Pearl Harbor quickly after his high school graduation. As fate would have it, he received a Purple Heart at Okinawa and is a member of one of the most decorated and famed Marine Divisions in the Pacific during World War II: The Sixth Division. 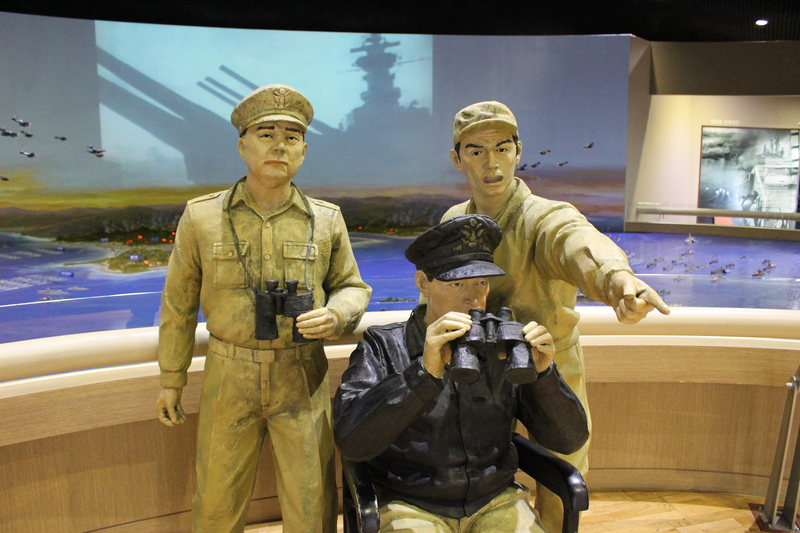 One of the division’s claims to fame was valiantly fighting and winning the Battle of Okinawa. 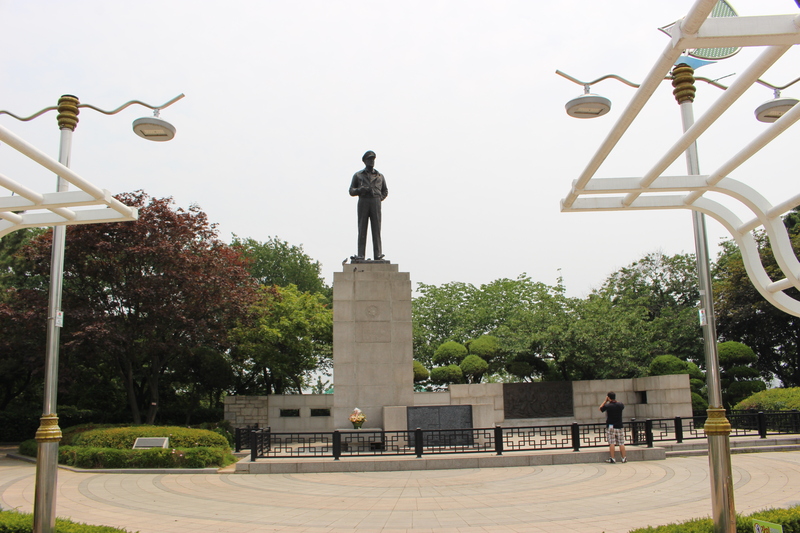 For as long as I can remember, I have heard stories about the battle, the island, and the Okinawan people. When I was accepted to my current position in Japan, I made visiting Okinawa while my grandfather is still alive one of my top priorities. I wanted to see what he saw from a first hand perspective. More than anything, I wanted to talk about Okinawa with him when I return from Japan at some point this summer for a few weeks. With these thoughts and conversations in my mind, I boarded a plane bound for Naha (major city on Okinawa’s main island) and looked forward to seeing the island though the lens of my grandfather. Almost immediately after arriving, I recognized the island was different than anywhere else in Japan. 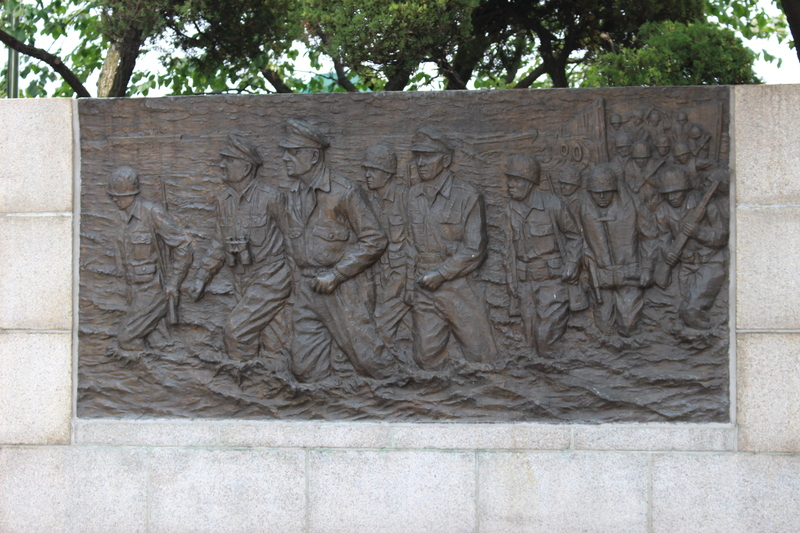 The presence of American military personnel, American military bases, and the English language in more places than on the main island certainly show how much of an effect American rule (until 1972) and the American military have had on the island. I will never forget hearing the jets roar past as I neared Kadena AFB shortly after arrival. The might of the US Air Force was awe-inspiring. I will spare the graphic details of many of the stories and discussions we had while I was younger, but it was amazing to see many of the places, beaches, and characteristics of Okinawa my grandfather described, much in the way he described them, more than sixty years after the fact. 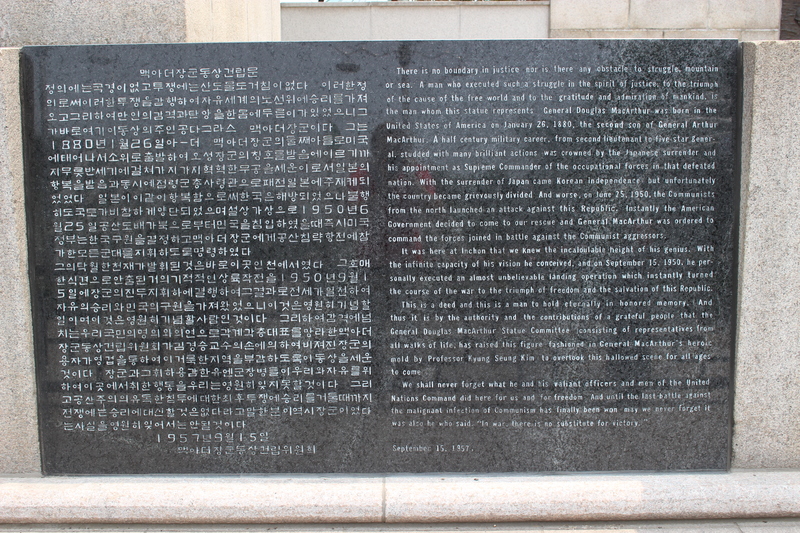 As I walked the city and the beaches, I could not imagine how much American blood was shed during the campaign and how fortunate I was that my grandfather survived the battle. While I rode a boat leaving Naha out on the open ocean bound for some smaller islands, I closed my eyes and envisioned my young grandfather and his friends as they were on their boats dodging fire from the small volcanic islands before landing on the main island. The feeling I received in that moment is something I will never forget. The rocking on the boat through the surf as the high peaks peaked through the water is feeling I will always remember. As the trip continued onward, I visited other famous war sites on the island and spoke with some Airmen and Marines I met out and about on the streets. This trip certainly was not all for leisure and I needed a change of pace when it came to traveling. Certainly the trip to Okinawa will resonate with me for years to come. 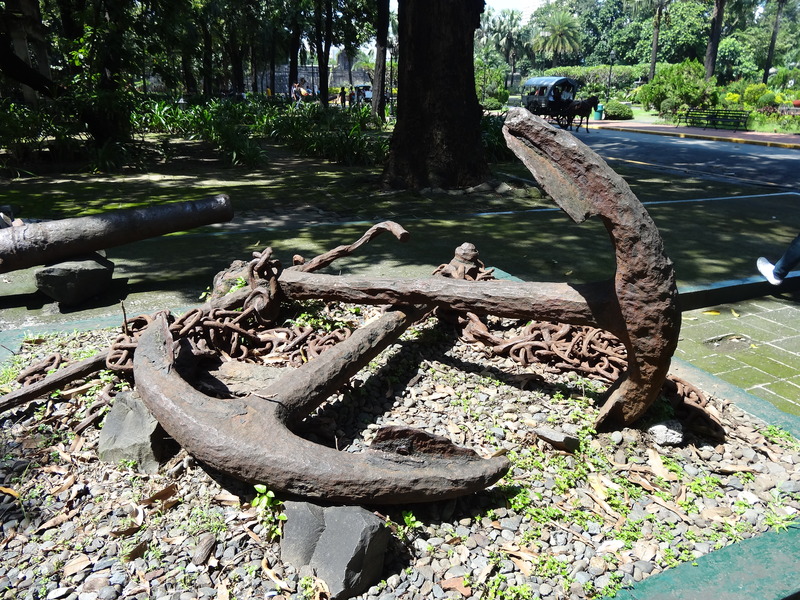 To get back to the main point of this post, it is important to travel with a deeper meaning than just sightseeing from time to time. It enhances the whole experience and allows you to focus like a laser on different aspects- history, relationships, family ties, etc., that may often be ignored while you are out on the road. This trip was so special for me as I connected with my family’s history in a first-person way that many people may never be able to do. If you have the chance to do this, you must. Needless to say, my grandfather was surprised and happy to receive the post card I mailed him from Naha. Have you ever traveled with a deeper meaning? What stuck out most to you? For anyone who has never been to the two Special Administrative Regions in China, what I am about to say could sounds shocking to some. The same could also be said by those of you that have been to Hong Kong and Macau. I am going to say it anyway, though. 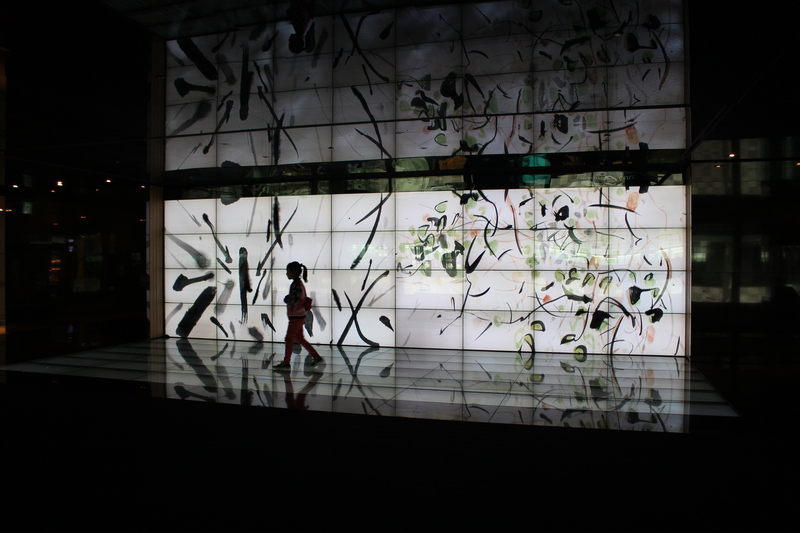 I liked visiting Macau as much as I liked visiting Hong Kong last week. 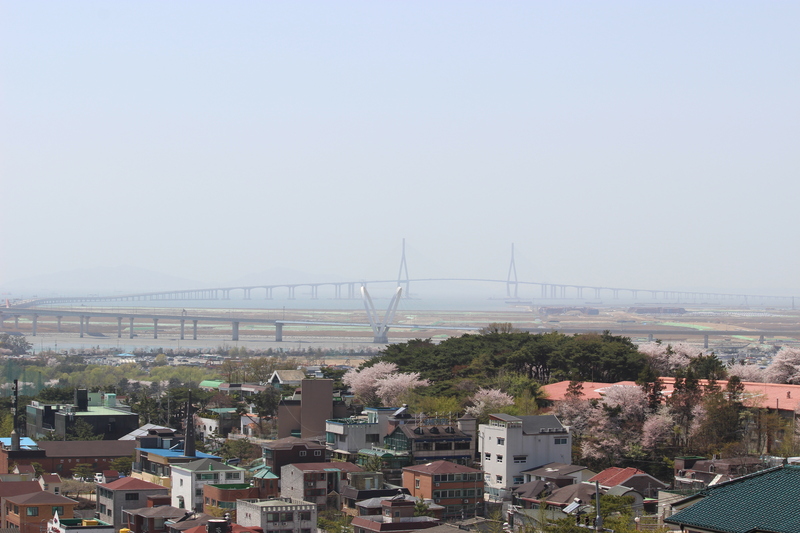 Both cities are great, but for very different reasons. The fusion of European and Chinese history and architecture, the different parts of the island and accompanying lifestyles, and the amazing photographic opportunities on the streets highlight some of the reasons why I loved my time in Macau. 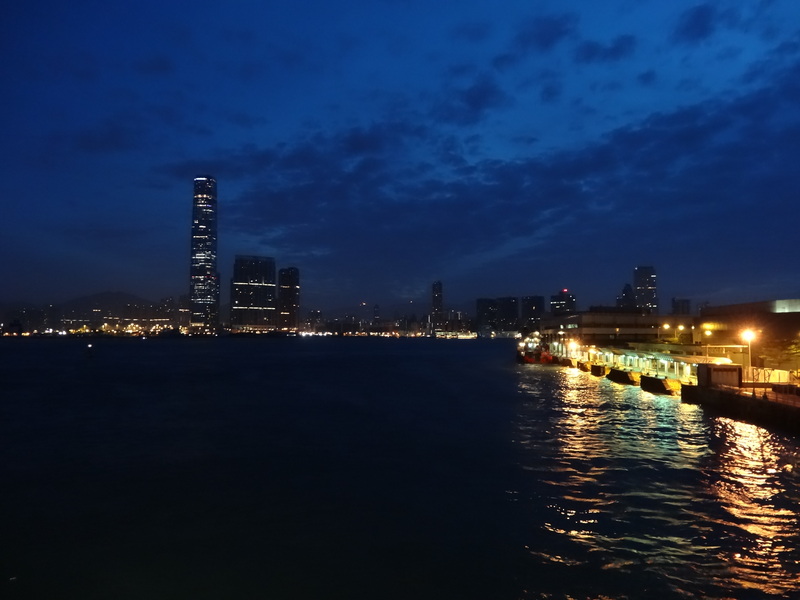 The whole day started off bright and early as my friend and I left our hotel in Hong Kong at 5:15 AM to start the walk from the Admiralty Station area to make it to Hong Kong – Macau Ferry Terminal in time for a customs check before our 7:00AM departure. The sun still had not risen and this offered a unique look over to Kowloon across Victoria Harbor. After the most cursory of all security checks (literally presenting a passport and walking through a line without metal detector check or bag inspection), we were aboard the TurboJET ferry with an 8:15 arrival time in the former Portuguese colony. As the boat swayed at the dock in Hong Kong, I worried about sea sickness, but that fear did not come to fruition. Nearly as soon as we exited Victoria Harbor and began passing through the many smaller Hong Kong islands, the easy and smooth ocean lulled me to sleep. 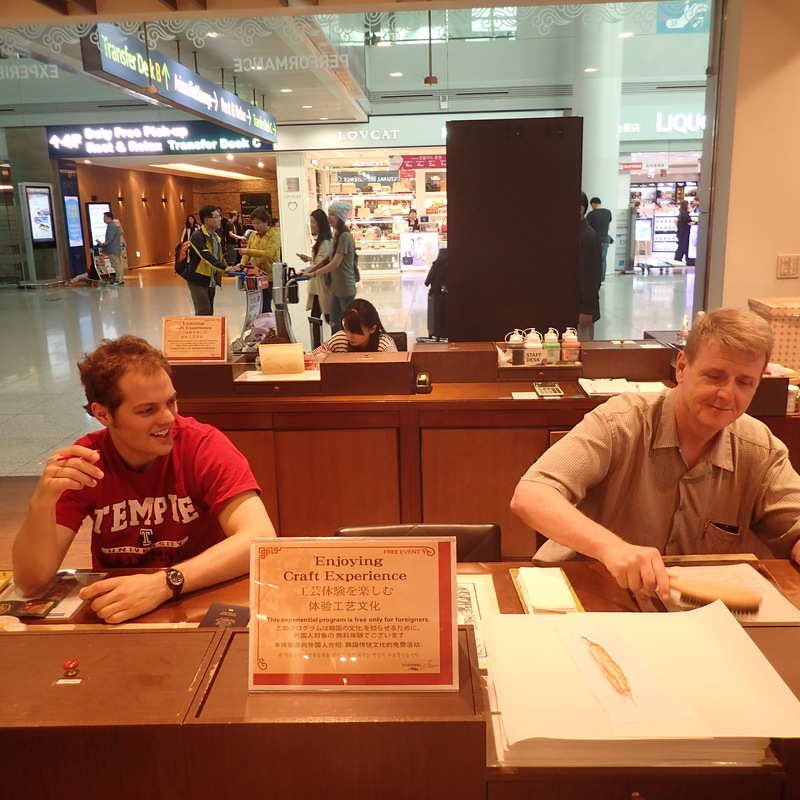 After dealing with some pushy mainland Chinese at the immigration stop in Macau, we were through but there was one big problem: no currency exchange desks or information desks were open. 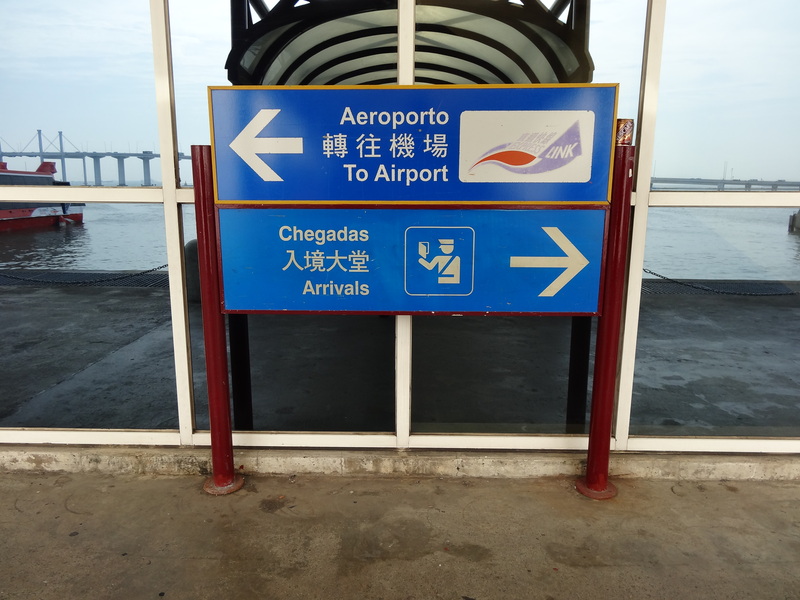 It sure was weird to see Portuguese on a sign in Asia. I had read in several places that you could literally travel through all of Macau for free on casino busses, but we wanted to have a map to make sure we knew where we were going. After getting our map, we found out the worst-kept secret in Macau was true: you can travel virtually anywhere on the island, for free, on a casino shuttle bus. We boarded the shuttle bus to the Wynn to position ourselves for a morning and afternoon traversing the famous Portuguese parts of town. 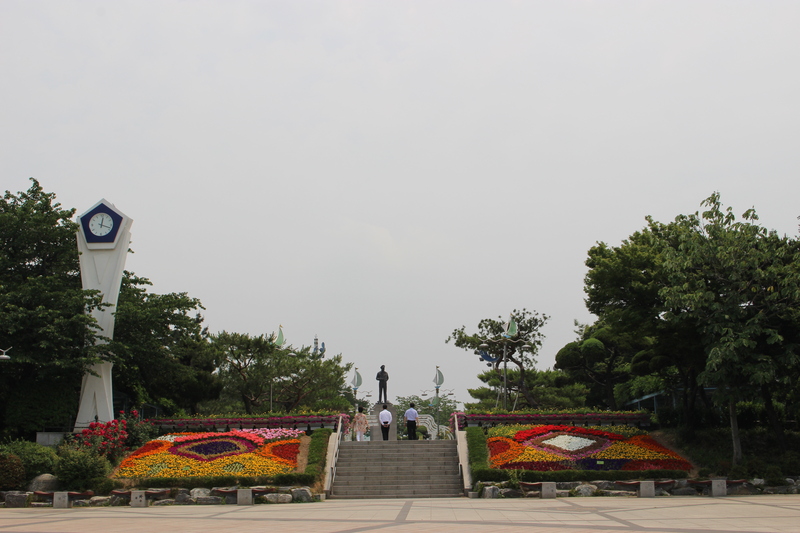 After a brief taste of the opulence and wealth that pervades Macau inside the shopping areas at the Wynn and on the casino floor, we began our walk around Nam Van Lake (past the Grand Lisboa) towards the government house to start our journey. Almost as soon as we arrived, I was enthralled with how well the Chinese had preserved the Portuguese and European architecture in Macau. Unlike Hong Kong, many of the older buildings from colonial rule were still in tact and vibrant. The colors on the administrative government building are something you will have to see to believe. I felt like I was somewhere in the middle of a Caribbean colony. It was odd to see a Chinese flag atop this building, but the colors were so vibrant. 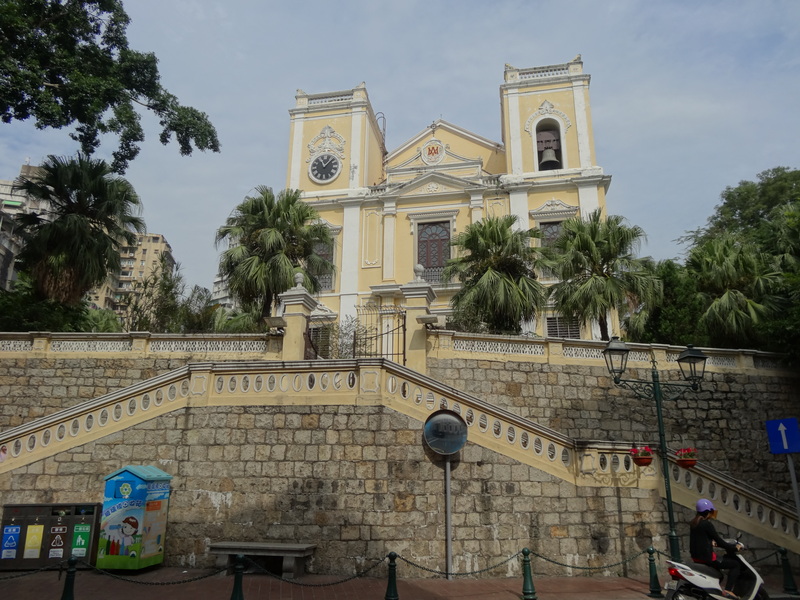 After a few more photos of the surrounding gardens and lotus pond, my friend and continued onward to the famous St.Lawrence Church where I witnessed something you could only find in Macau. 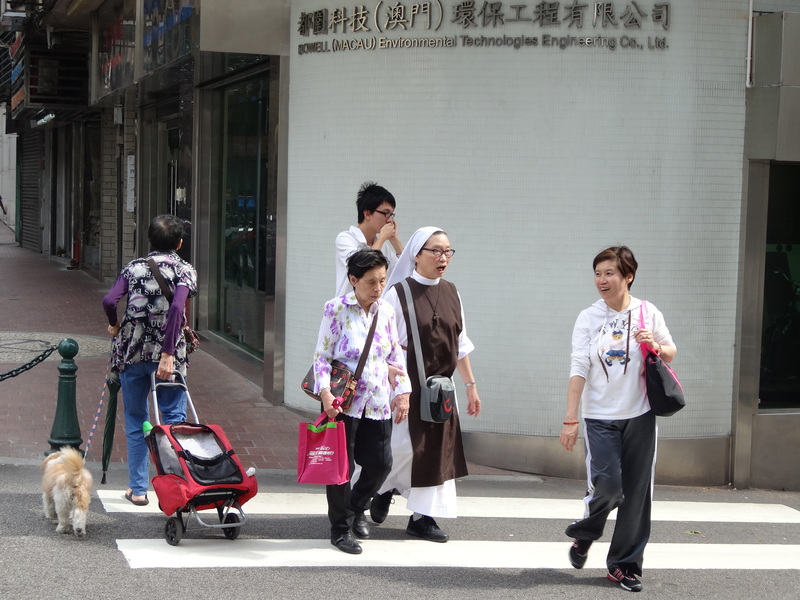 Amidst the bustle of mopeds and motorcycles on every corner, a Catholic nun walked down the street with several other people. Here is a photo of that unforgettable moment. You could never capture a moment like this in Hong Kong. 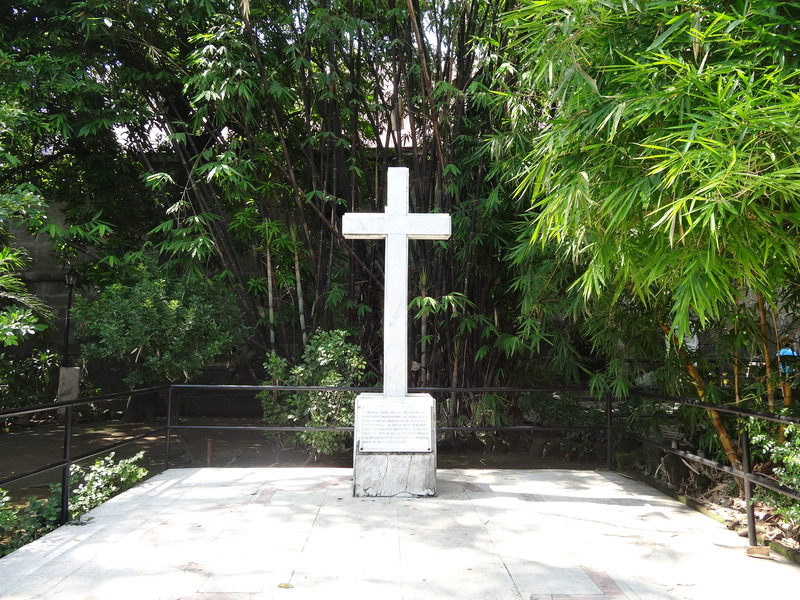 The fusion of East and West was so evident outside of St. Lawrence Church. I loved watching the bicycles and motorcycles make the hard left turn in front of the church to continue down some more narrow streets where other bikes and pedestrians waited. Here is a shot of the area surrounding St. Lawrence Church. 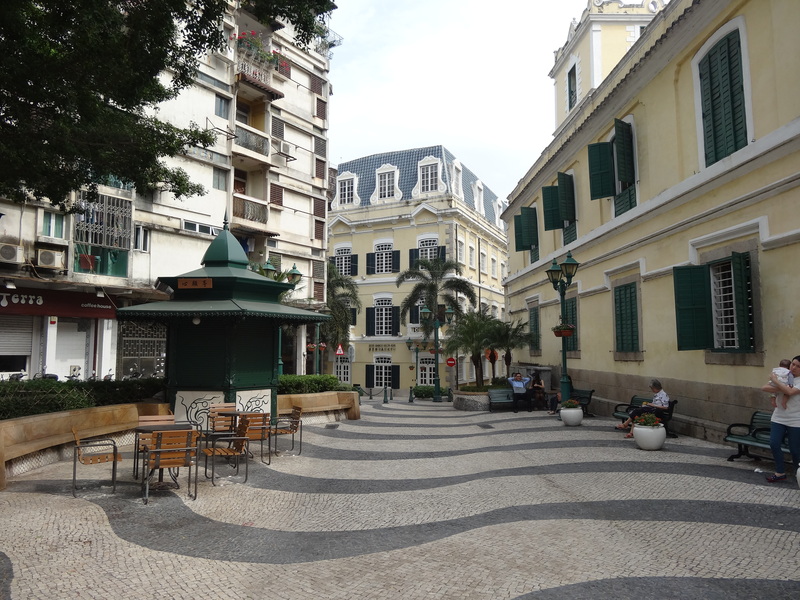 The sounds of a lively colonial city still emenated as we walked up the tiled slopes of this part of Macau with our sights set on finding Senado Square and then taking the famous walk through Macau to the ruins of St. Paul’s Cathedral. Fortunately for us, we were sidetracked and encountered even more mosaic-covered plazas and beautiful churches along our meandering route. There were more bikes along the way, too. 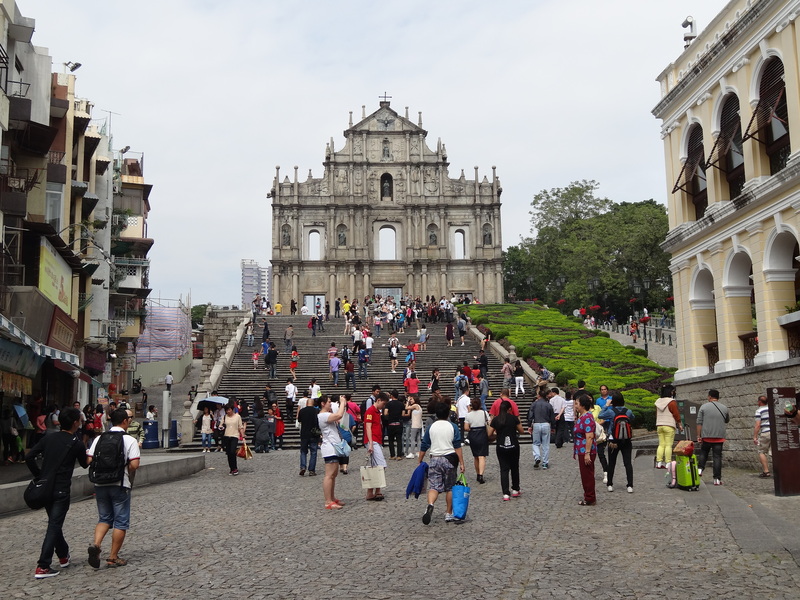 As we walked through more cobblestoned streets where Asian-style architecture was right next to European architecture, I fell more in love with Macau as I took each passing step. 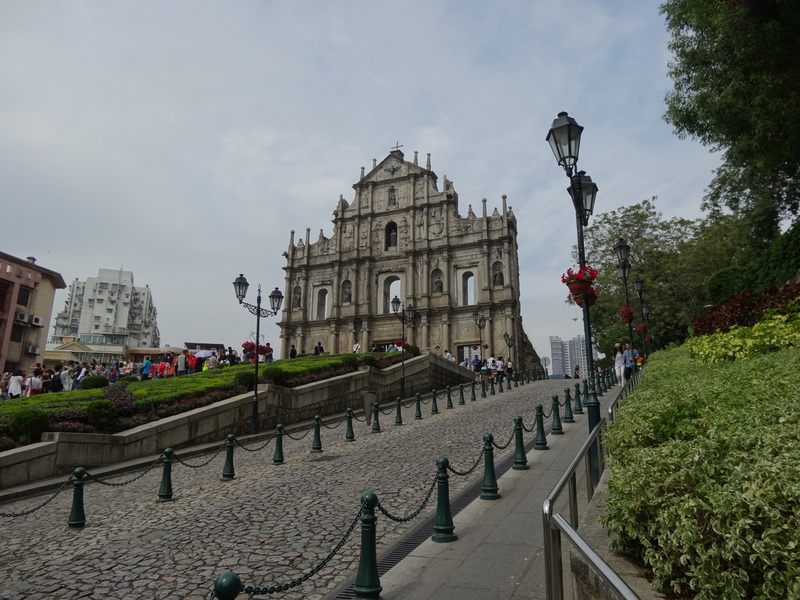 Originally my friend and I had planned this trip to Macau as a nice excursion to gamble a bit and check out the view from Macau Tower, but we quickly realized that we needed to spend an entire day making our way through the “other part” of the city, away from all of the glitz on the south side of the island. It was a great choice and one I will never regret. 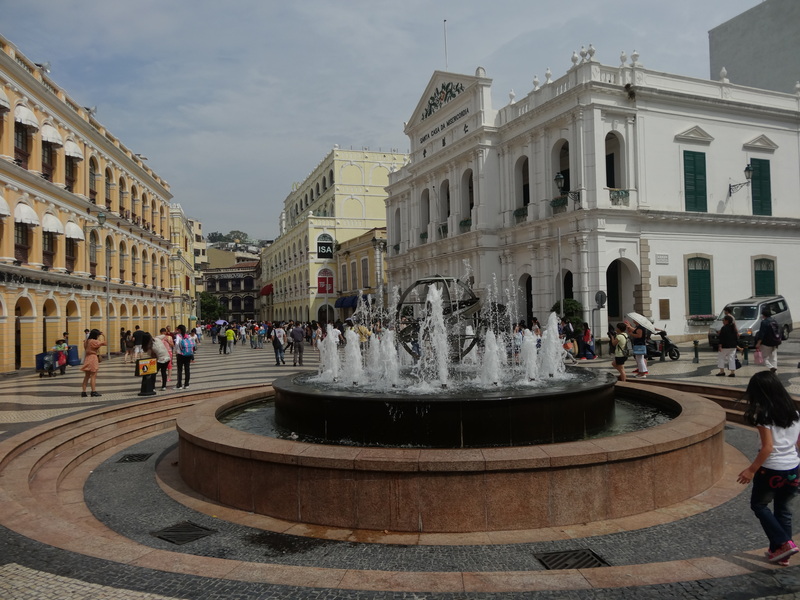 Over time, the number of tourists and other people picked up and we knew we were nearing the famed Senado Square in the heart of Macau’s Portuguese-influenced area. Just like that, the iconic mosaic-tiled square was upon us. As if it was a scene from a movie, we entered Senado Square as a band on the street played the song from the Star Wars cantina bar and here is what we saw. Everything from the teeming energy on the square to the architecture made me think I had been transported to Europe. It was impossible to believe that we were seated in China. I wished I had a time machine to go back to the mid-19th Century or the early 20th Century to see this location in its colonial heyday. Down on the square, my friend and I even ran into one of our friends who lives in Japan by mere coincidence. The world is such a small place. From Senado Square, my friend and I navigated through the quintessential Asian street market to make it up to St. Paul’s ruins. As bartering for a fresh Portuguese egg tart happened on the left, more negotiating over the price of famous pork happened on my right. A couple tried to push their newborn up the hill in a stiller, and I saw a Dairy Queen store and Nike outlet near the end of the passageway. 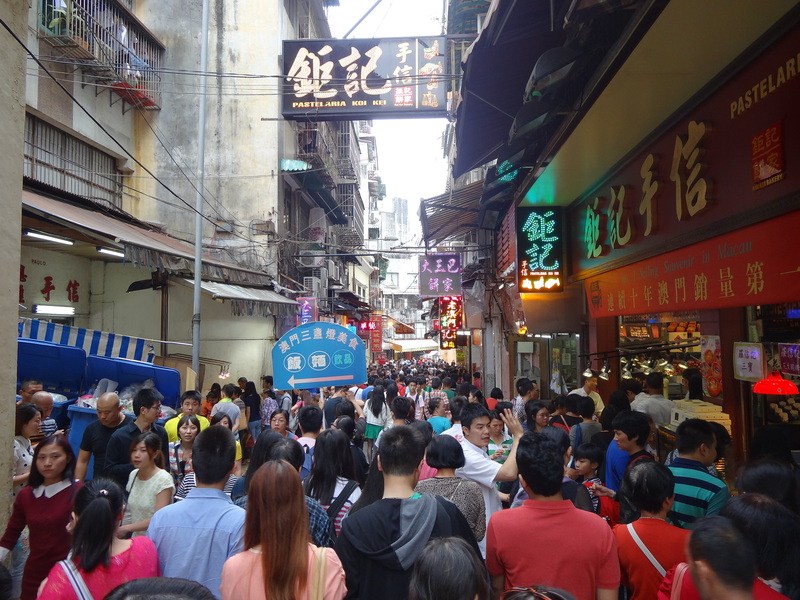 This controlled chaos is one more reason why I loved this walk through old Macau. European streets were dominated by some of the best street food in all of Asia. As soon as this chaos broke, the reason why we began this journey appeared on the horizon: the ruins of the beautiful St. Paul’s Cathedral, destroyed by fire centuries ago. The scene was beautiful. An immaculately constructed Catholic facade sits atop several flights of stairs in the middle of the bustling Asian market. Behind it all, you can see the high rise buildings of new Macau. I only wished that I could have seen this church before its destruction. At that moment, the sun broke through the crowds and offered up an even better view of the ruins. At that moment, I was convinced that Macau would continue to be one of my favorite travel destinations– and a place I would want to see again in the future. As much as I loved Hong Kong, I did not encounter these types of cultural treasures during my two days walking the streets of China’s other Special Administrative Region. My friend and I did not stop there. 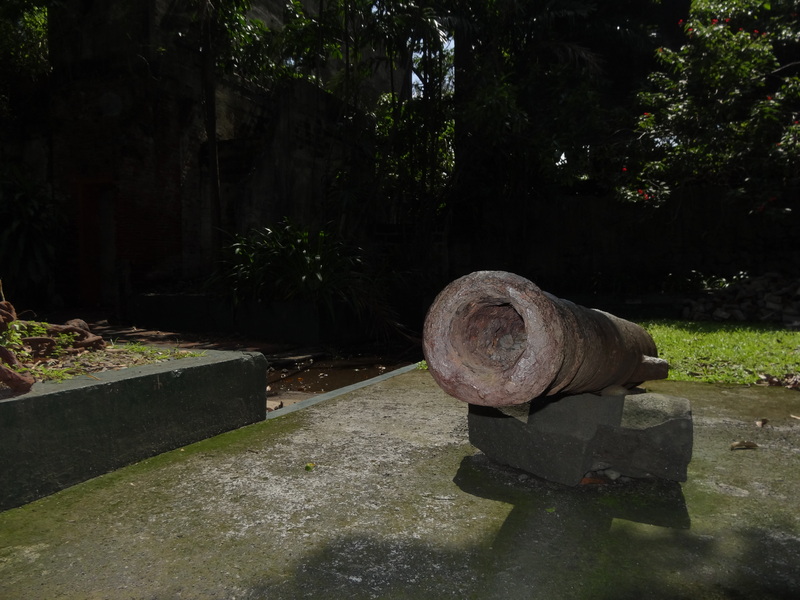 We visited the fort adjacent to St. Paul’s to see another Portuguese legacy in this part of the city. The key component that helped the Portuguese stave off a Dutch invasion in 1622, Fortaleza do Monte offered more stunning views of the Macanese skyline and helped emphasize the unique fusion of East and West, new and old, that Macau has to offer to even the historical novice or casual day traveler. 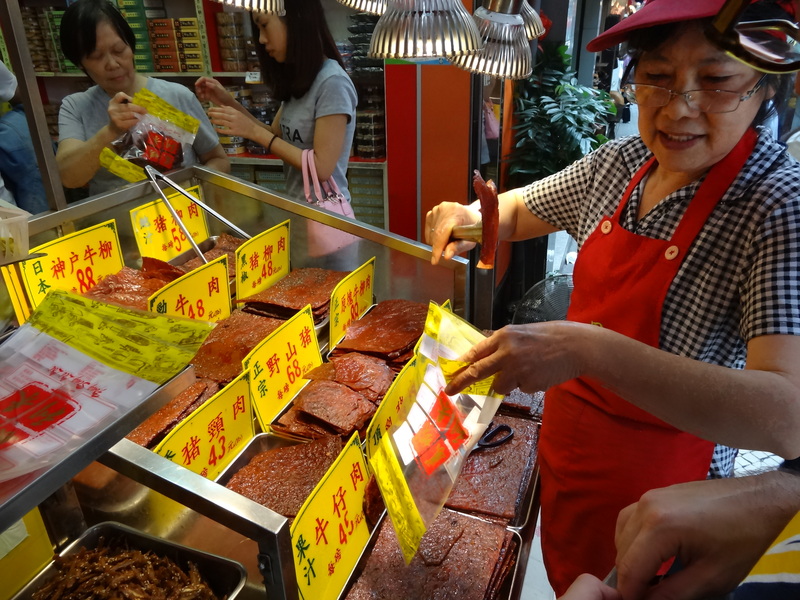 In between a stop at the Grand Lisboa and taking in a show at another casino, my friend and I also ventured to Taipa to see some more colonial sites and take the chance to sample some Macanese and Portuguese food on the streets. 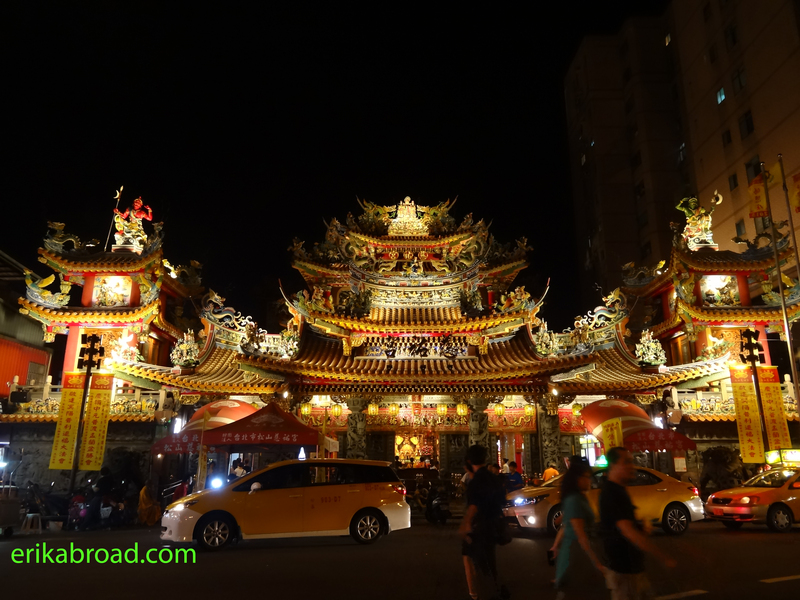 As well preserved as the Senado Square district was, I thought Taipa was even more well preserved. Whole blocks were painted to period colors. Colonial artwork and buildings dominated the landscape. There were even numerous Portuguese restaurants lining the streets. 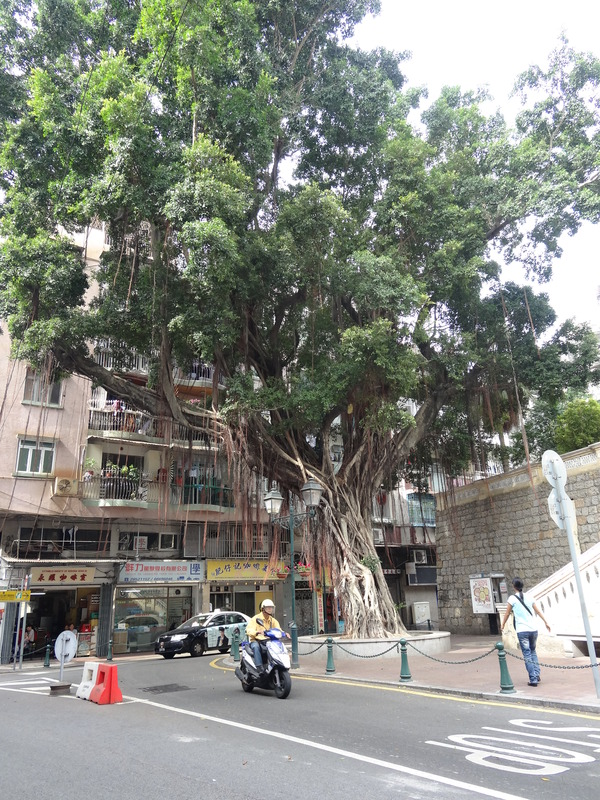 This type of neighborhood is another site you would not be able to find in Hong Kong because of the development and expansion the city saw since the change in economic policy in the 1970s. 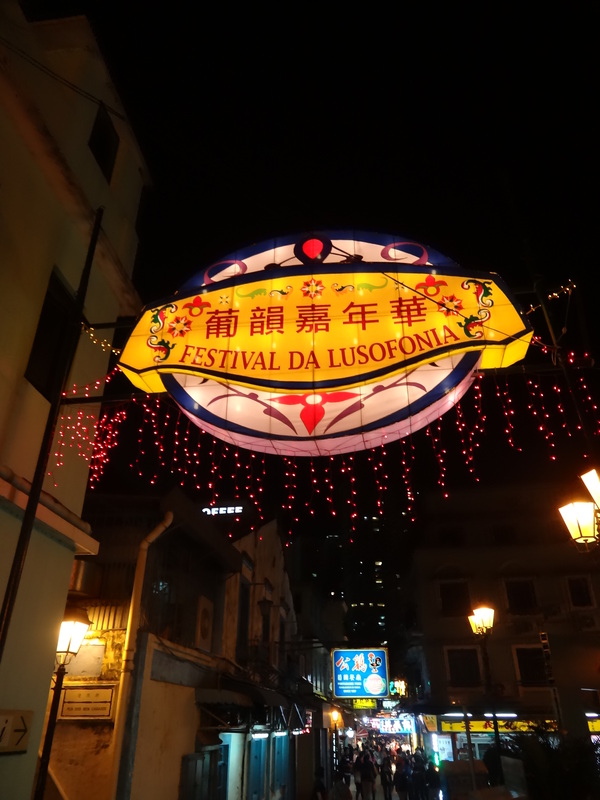 We even stumbled upon a Lusophonic festival in this part of the city. 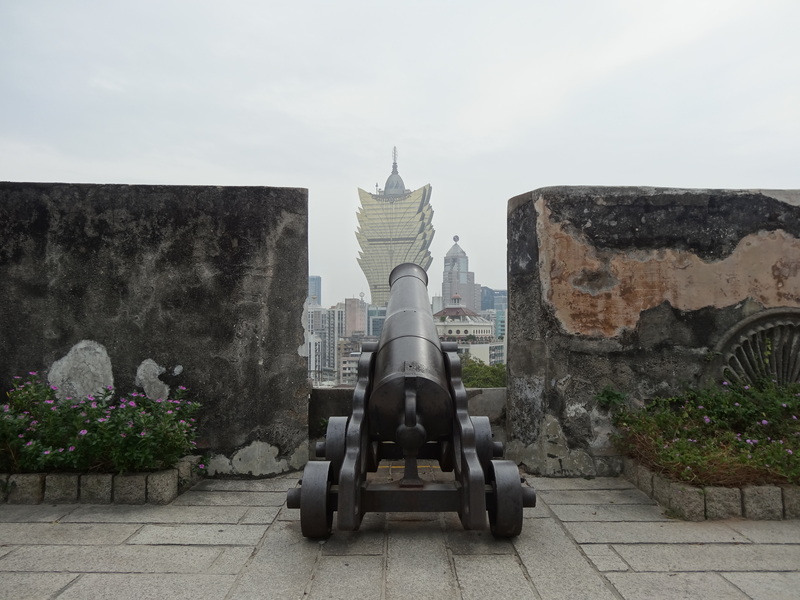 Of course a day in Macau is not complete without a trip to the Grand Lisboa to gamble and a trip to Taipa Island to see a show, but I wanted to focus this post on all of the unique historical sites that Macau has to offer, making it one of the most interesting and memorable places I have ever visited. Growing up close to Gettysburg, Washington, DC, Antietam, and Harper’s Ferry, I have always had a deep appreciation for history and historical preservation. 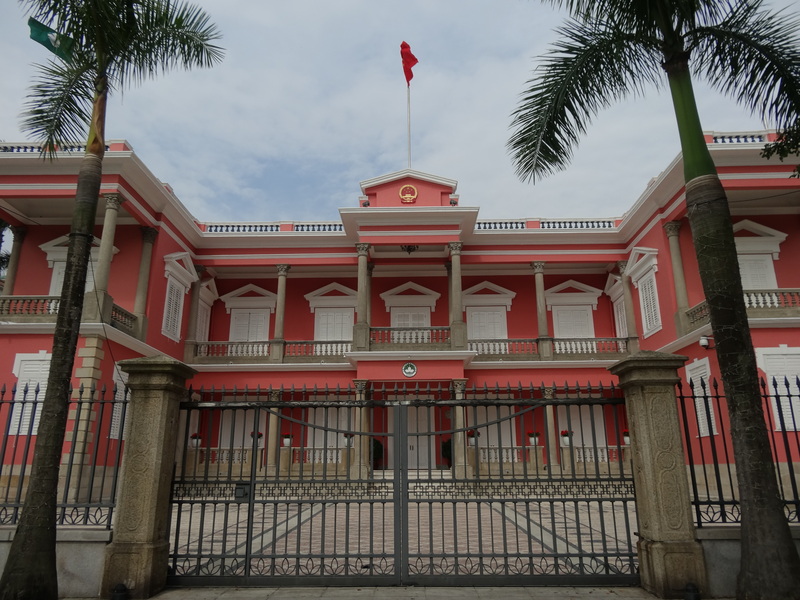 When I came to Macao, I expected much of Portuguese colonial legacy to be eliminated for a host of reasons, but I was pleasantly surprised to see much of it in tact, preserved for future generations to appreciate. Something about the cobblestone, the mosaics, the buildings, and prevalent appearance of Portuguese give the world’s most densely populated city a different vibe. This fusion of cultures, languages, foods, and architecture makes Macau a photogenic city with so many unique experiences around each corner. I loved Macau for very different reasons than why I loved Hong Kong, but it is a very worthwhile destination in the region. 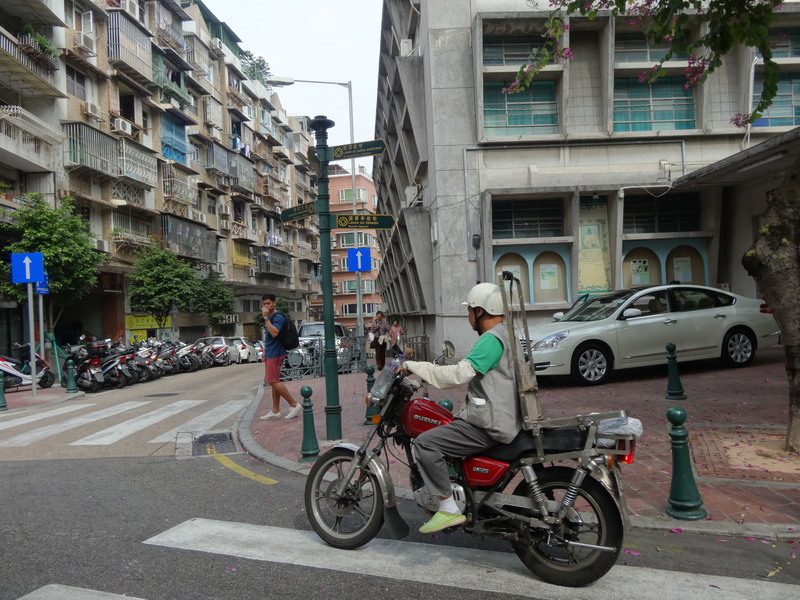 I went to Macau skeptical about how good of a place the island would be, but I left knowing it was an amazing experience that I will never forget. I will put a post in the future about how nice the casinos and Macau Tower were, but this post is dedicated to why Macau is as good as Hong Kong and why any traveler to Hong Kong has to take at least a day trip to Macau if they have the time. 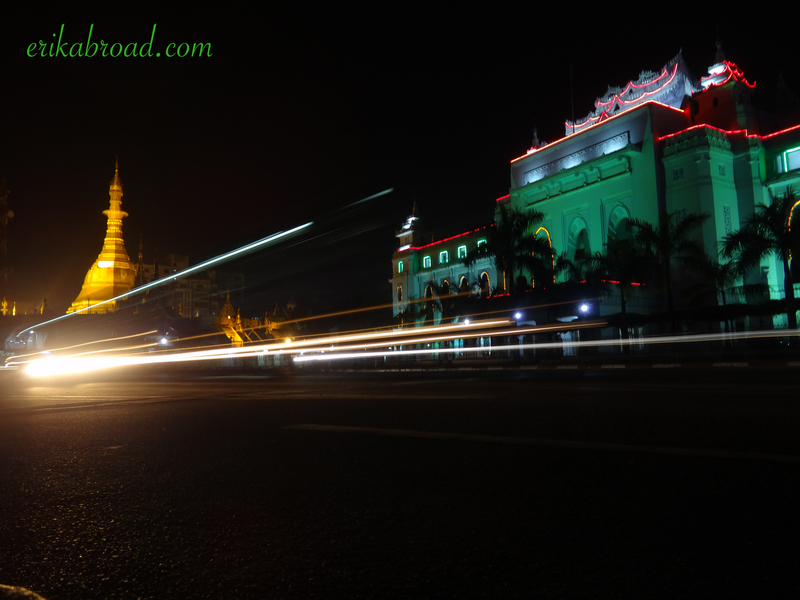 It is an unforgettable destination. 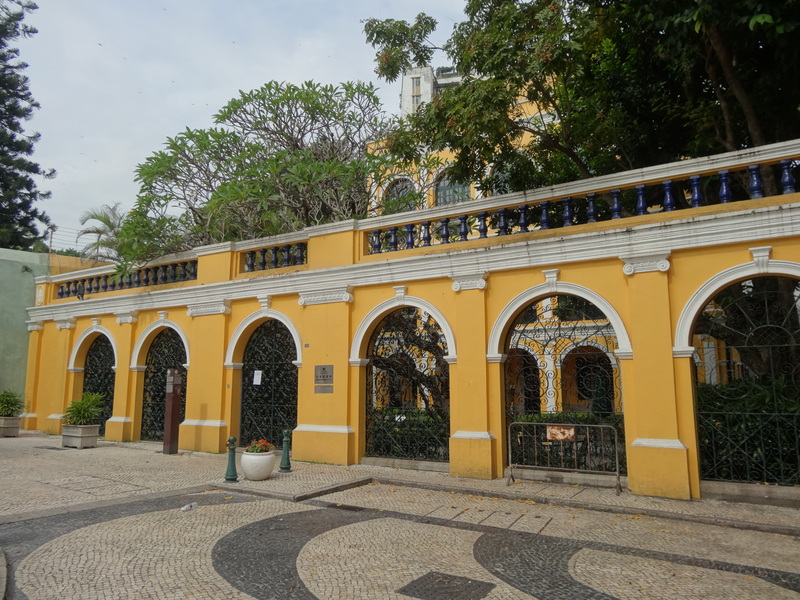 I will admit that I knew virtually nothing about Macau before my friend and I decided to take a day excursion during our stay in Hong Kong to the former Portuguese colony. Sure, I knew about the casinos, the gambling, and St. Paul’s ruins, but other than that, I knew virtually nothing. I must say that the more I read about Macau and its unique blend of East and West (the Portuguese were there for much longer than the British were in Hong Kong), the more I look forward to visiting the world’s most-densly-populated city. As someone who studied and analyzed Western influences into the East, colonies, and international trade, Macau seems like it is going to be an unforgettable trip. 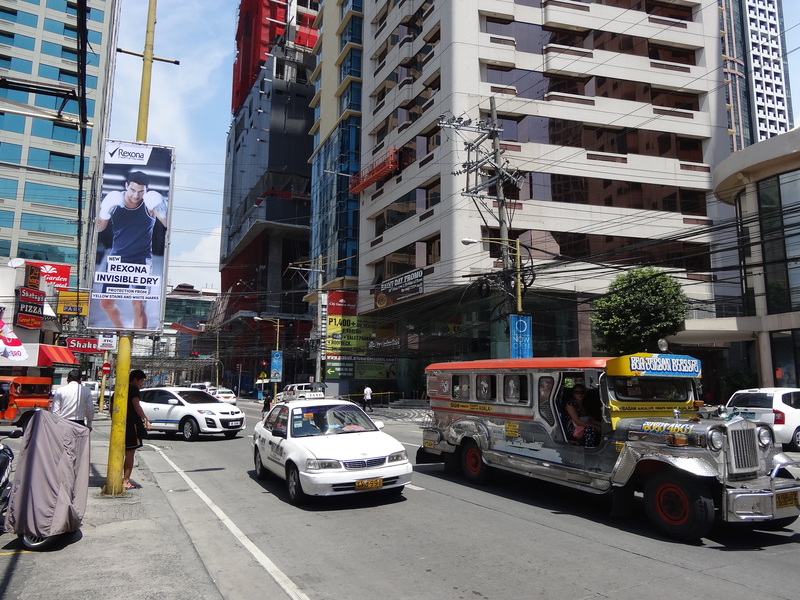 Unlike anywhere else in Asia, at least according to the photos I have seen, it appears as if European architecture and influence has been remarkably preserved. Everything from St. Paul’s ruins to the other Catholic churches that still stand to Senate Square appears to be in immaculate shape. I certainly look forward to trying some Portuguese food and enjoying an egg tart or two as I stroll through the Macanese streets in a few days. 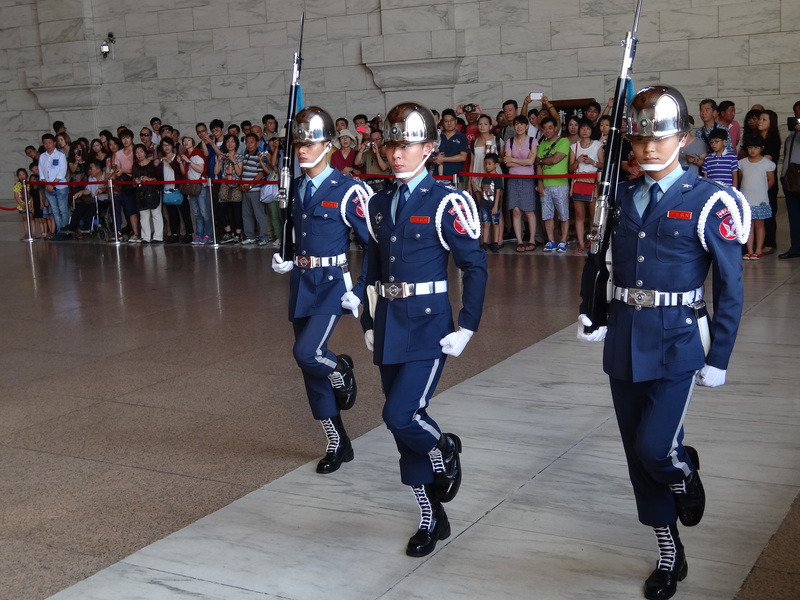 It’s just not religious and cultural history that sets Macau apart from the rest; military history is also in this city! A fort used to repel a Dutch invasion attempt hundreds of years ago still stands and will be one of the first things I visit in Macau. 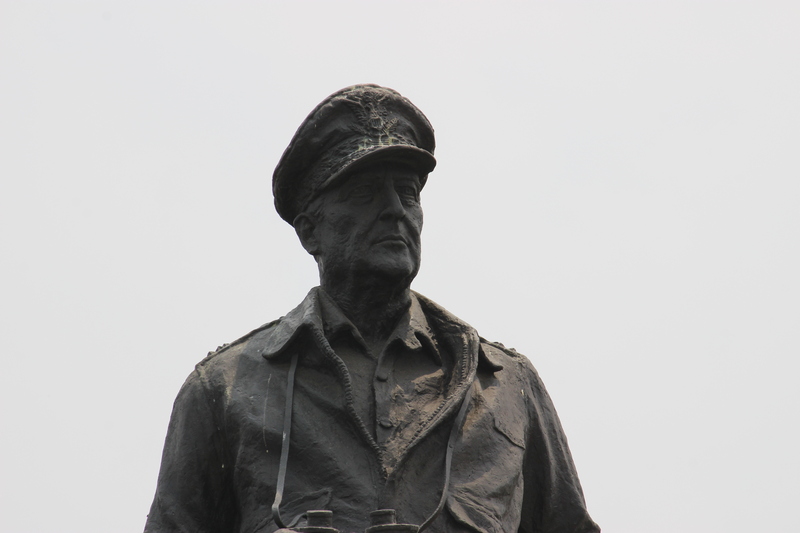 As someone who grew up within a stone’s throw of Gettysburg, nothing is more interesting than military history. From those spots, we will certainly go to Macau Tower and then make our way to the casinos and eventually to take in the world-famous House of the Dancing Water in the evening, but I am looking forward to taking in all of the unique historical and cultural history that only Macau has to offer.